which is spread over 3 acres consisting of 25 types of palm trees, 30 varieties of fruit trees, 24 types of hardwood & flowering trees, 24 different tropical flowering plants, 26 varieties of bamboo and 13 Hawaiian plants. Our tour guide was really funny, high energy and most of all, very informed on all of the plants, foods and gardens. Steelgrass Farm tour is educational and fun! Sample 10 varieties of the finest chocolate and up to 20 types of tropical fruit depending on what’s in season. I have lived on Kauai for 12 years and still never heard of, much less tasted, many of the fruits which were available during the tour. 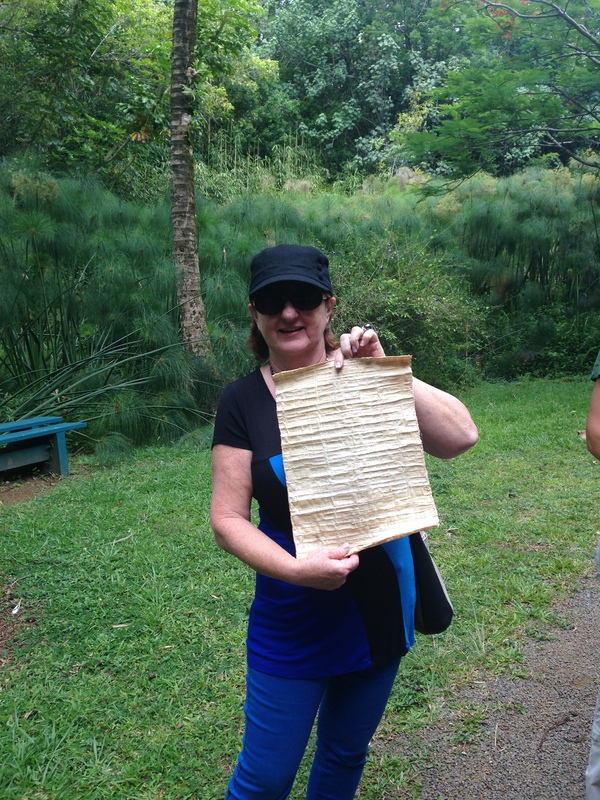 This is a family-friendly, interactive tour and involves a bit of walking. There is a vehicle available to transport guests who have difficulty with walking on some of the steep parts of the trail. Be prepared to touch, smell and sample produce along the way. As you arrive at the beautiful farm, staff will be present to assist with parking vehicles. I highly recommend bringing your own bottled water as it can get hot and there is a bit of walking involved. Definitely bring a camera! The grounds are absolutely breathtaking and a great place to snap a few family photos along the way. Much of the trail is shaded which is nice and there was a breeze the day we toured; however, it is a great idea to apply sunblock beforehand. Bug spray, all natural of course, is provided throughout the tour. 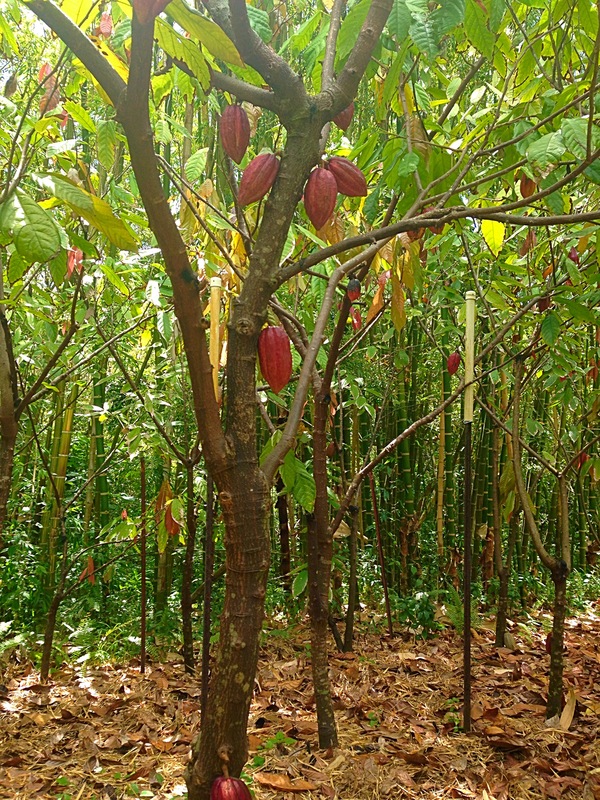 I thought it was fascinating to learn that Hawaii is the only state where chocolate trees grow. 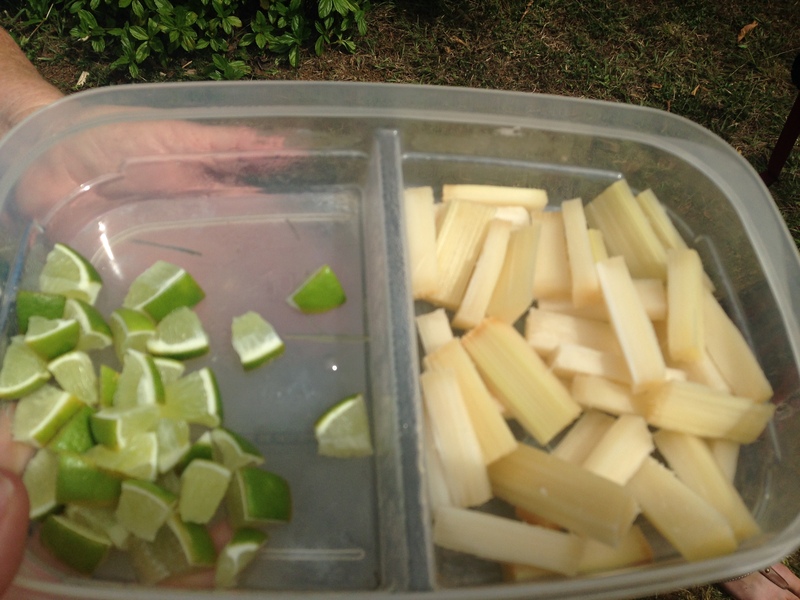 In the beginning of the tour, we sampled a stick of sugar cane (KO in Hawaiian) served with a Tahitian lime wedge to rub on the cane before indulging. It was so good and not overly sweet or splintery. 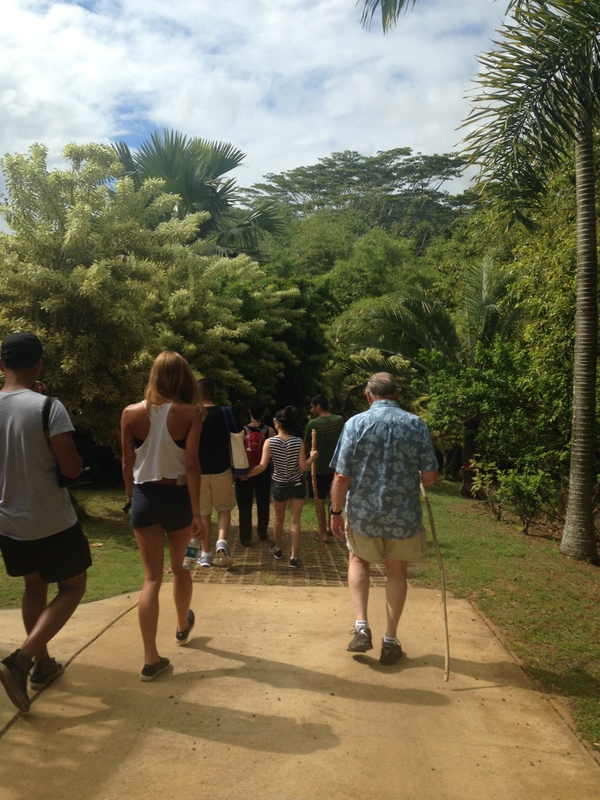 Next, we followed our tour guide 400 feet along a shaded trail passing rare black bamboo, papyrus plants, exotic orchids, vanilla vines and much more. I stopped to take pictures along the way. The guide stopped in front of most of the tress, plants and fruits to talk about what they were, where they originated from and where are they found today. 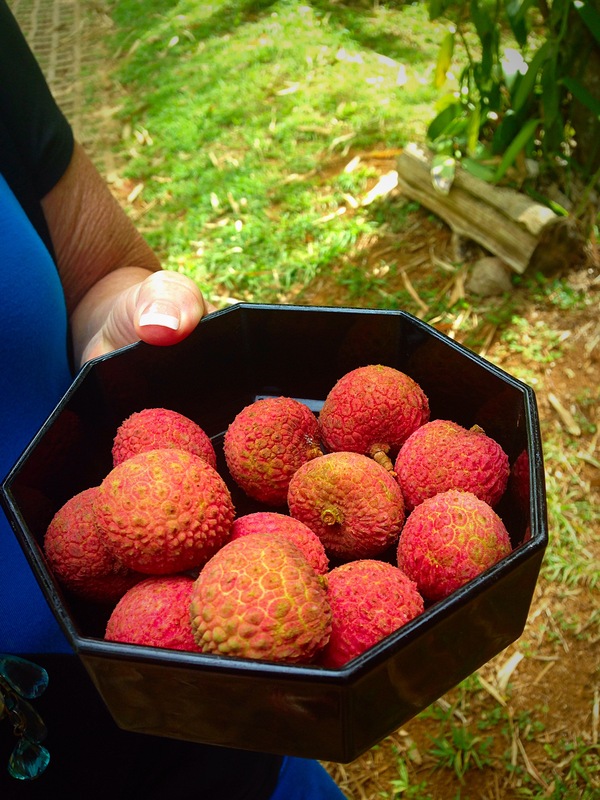 There’s nothing more refreshing than stopping along the trail, in the shade to sample fresh lychee! Yum! 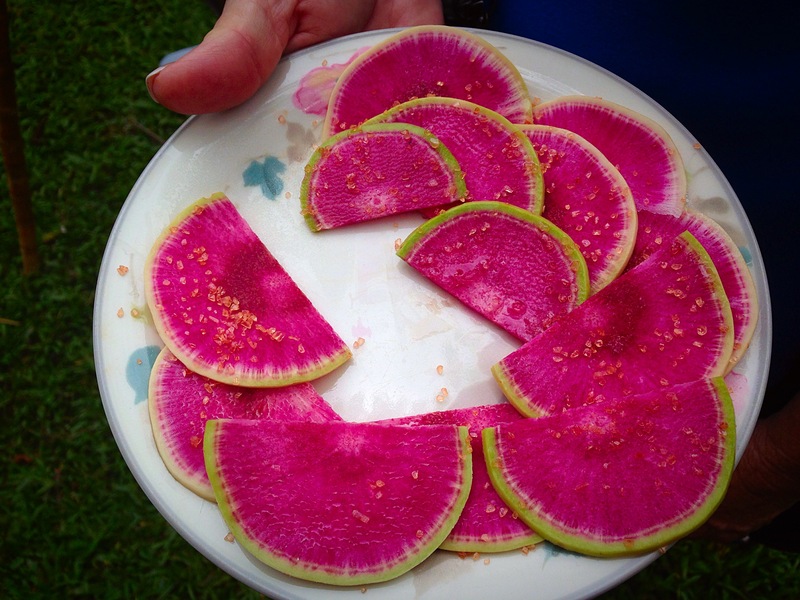 In the picture at the top of the page, you will see the watermelon radish which is gorgeous to look at. The taste is intense, as most radishes are, but the Kauai red salt on top took away that strong bite and we went back for more! The funny thing was to watch some of the people on the tour actually eat the radish slice like a watermelon, leaving the green outer rim. I highly recommend using this radish, thinly sliced in a garden salad. Plus, it is just gorgeous to look at. The colors are so vibrant. 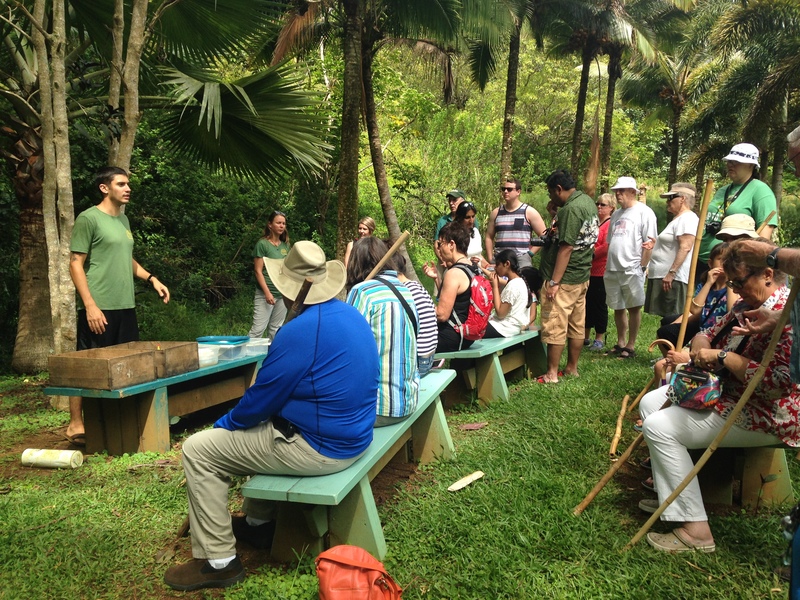 The tour guide led the group to an area in the middle of the botanical garden with benches to sit down and listen to the presentation. He described the various fruits and then passed them around while he spoke about them. Guests were encouraged to ask questions and come up for seconds. It was a true paradise in the garden. Nice and cool and every time the wind swept through, you could see and hear the trees swaying. There were some rather unusual fruits to sample on the tour. 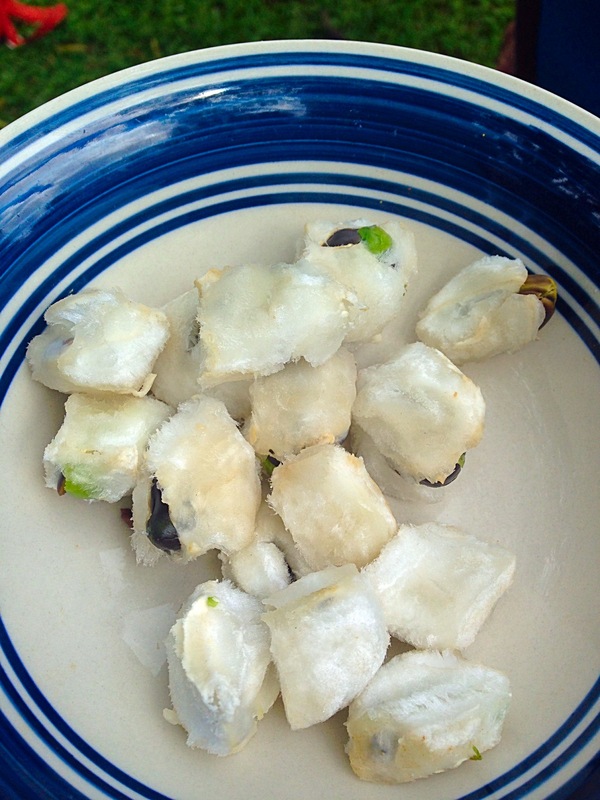 One of my favorites was the soursop AKA Custard Apple. Not exactly an appetizing name, but it was surprisingly very sweet and soft. The next fruit which was equally unusual was an Ice Cream Bean which many people on the tour were familiar with. The Ice Cream Bean was almost a furry, fuzzy-like texture but the flavor was sweet. I really appreciated seeing what the fruit looked like with the skin on prior to seeing it cut up. Now when I go to local farmer’s markets, I will know what the fruits are and how they taste. 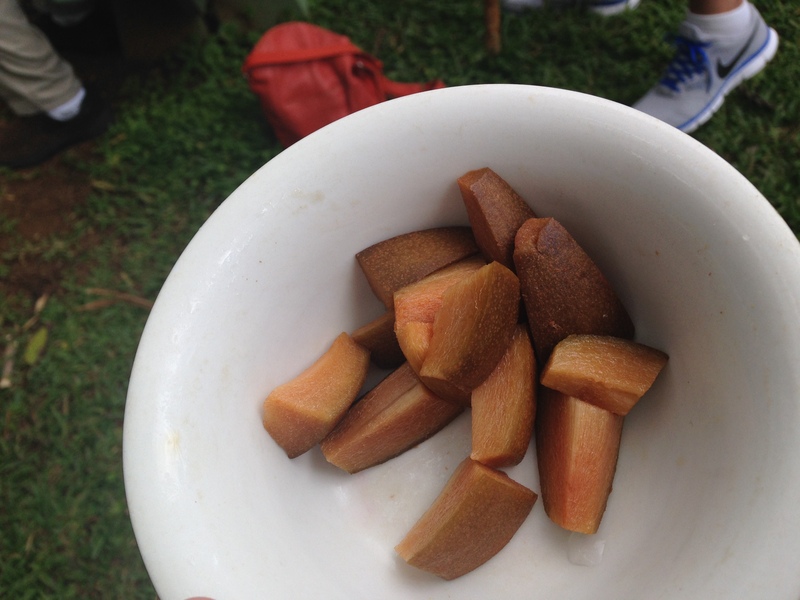 The fruit that just blew me away was the Chiku AKA Sapodilla. I have not seen, heard of, nor tasted this fruit before. It looks a little unappetizing, brown and mushy but tastes like apples marinated in cinnamon. I couldn’t believe it! 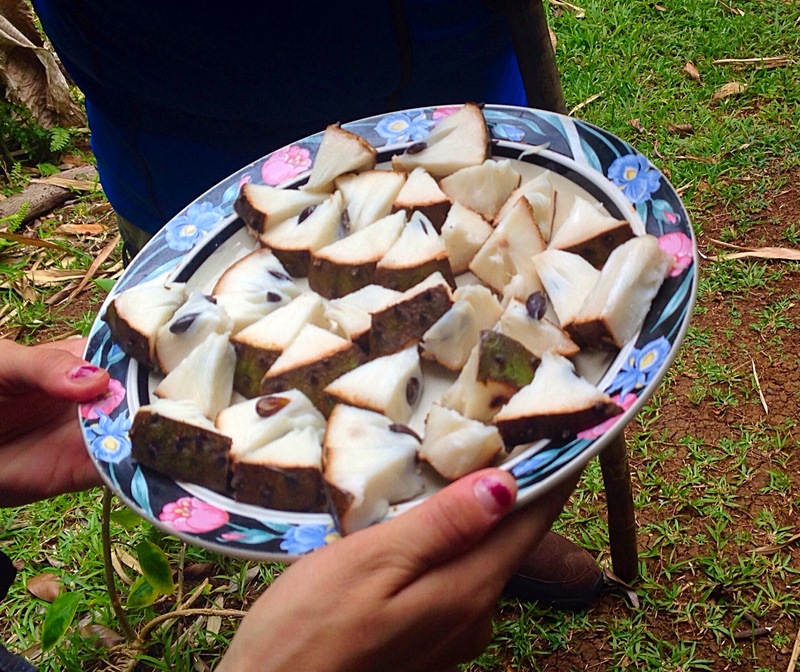 There are so many more fruits that we sampled during the tour such as longan, starfruit, guava, jabong, Ka’u orange, acerola cherry AKA Vitamin-C Tree, lilikoi and dragonfruit. The nice thing is that each guest will leave with a print out of what fruits and chocolates were included in the tour. Then you can go home and research the areas and seasons the fruits can be found in. 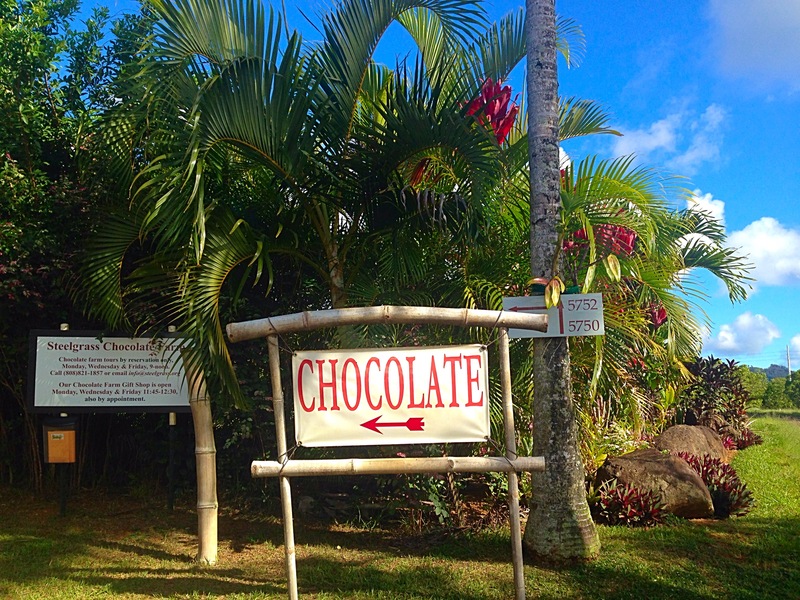 The tour is called CHOCOLATE FARM tour, so let’s shift gears and start talking about chocolate. The chocolate portion of the tour takes place after the fruit & farm tour. The guide handed us off to a member of the Lydgate family who is the farm owner and well versed in the process of International chocolate production. First, he talks about the cacao plant, then breaks one off of the tree, cuts it open for everyone to see and passes it around. 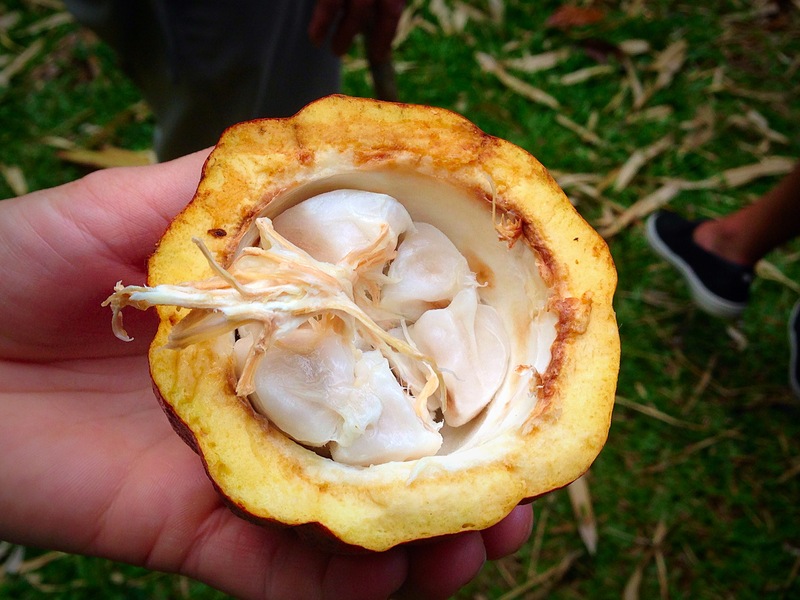 Did you know that cacao has the highest concentration of antioxidants in any familiar food? Yes, more than broccoli, alfalfa spouts, plums, spinach, acai berries and even kale! Milk chocolate contains 6,740 units per 100 grams and dark chocolate is 13,120 units. Next, we move over to a covered area where Mr. Lydgate offers an hour-long presentation, along with 10 chocolate tastings from around the world. Each guest is given a sheet to jot down the notes that he/she tastes in each chocolate such as dried herbs, earthy, roasted, molasses, honey, berries, caramel, woody, citrus, etc. At the end of the presentation, the chocolate types are revealed. It is similar to wine tasting. A children’s tent is available with activities such as tattoos and coloring for those who don’t want to sit for an hour. All of the chocolates are gluten-free and do not contain any nuts. The presentation was very educational, learning that chocolate made with high cacao % is actually much healthier than the fillers used in the store-bought milk chocolate candies. Most of the chocolates in the tasting contained 60%+ of cacao and many of them were more than 70% cacao. The milk chocolate contained 50% and the white chocolate is 32%. We learned about which chocolates are commonly used by pastry chefs and why. We learned why some chocolates are gritty while others are not. There are a total of 13 samples of chocolate between the tasting tent and the welcome tent. At the end of the tour, there is an opportunity to purchase some of the local chocolates and other products. You can also find cacao nibs which are bits of the cacao bean that can be added to salads and used in various other recipes. In fact, they provide a free recipe book for the nibs. Unfortunately, the Steelgrass chocolate bars are not available on-line nor sold anywhere else. 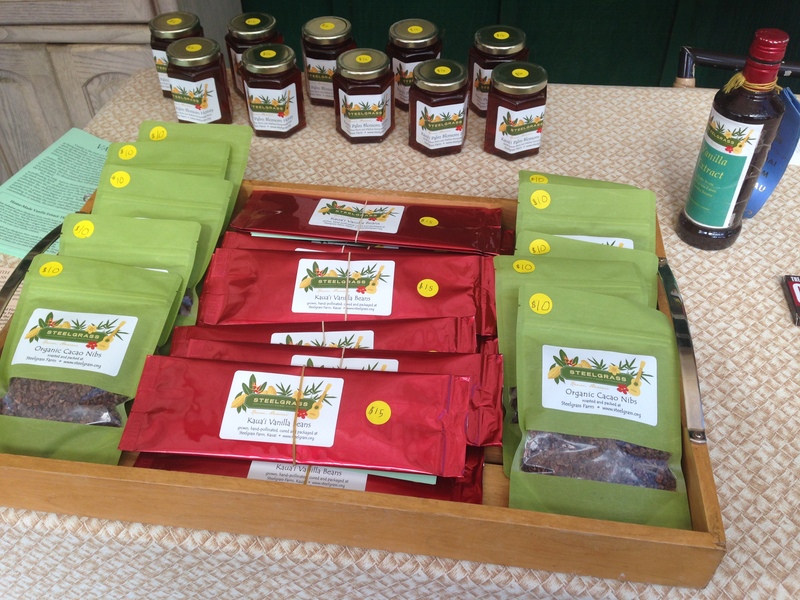 If you enjoyed the Steelgrass chocolate samples, be sure to purchase them at the farm!!!! The chocolate farm tour is available M, W & Friday for $75 per person, 12 & under free. Reservations are required. 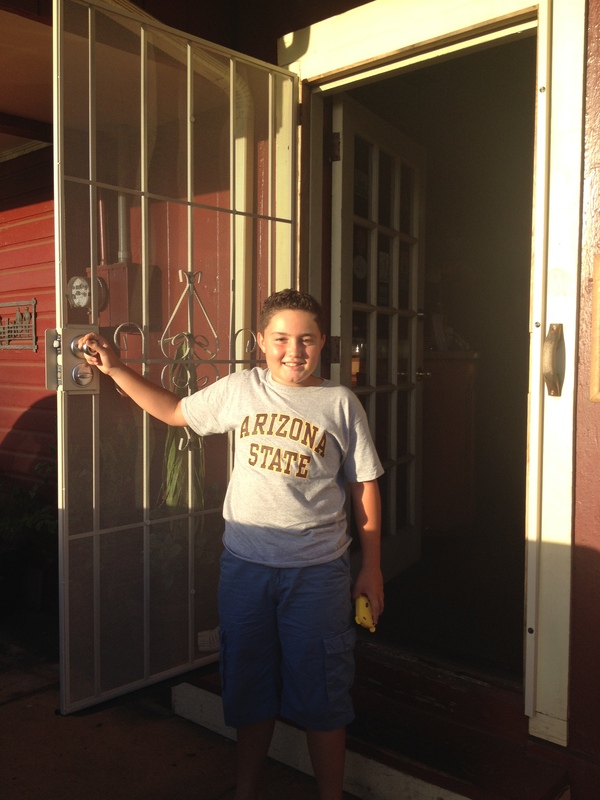 Call (808) 821-1857 or visit info@steelgrass.org for more information. 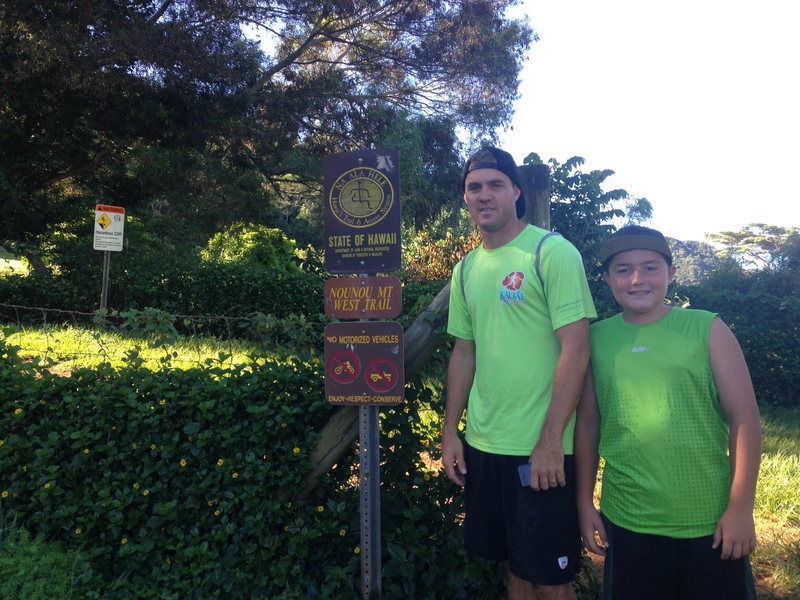 Adding to the “Travel Fit” section of our family travel blog ~ hike the Sleeping Gaint! Get out and get moving with the whole family. 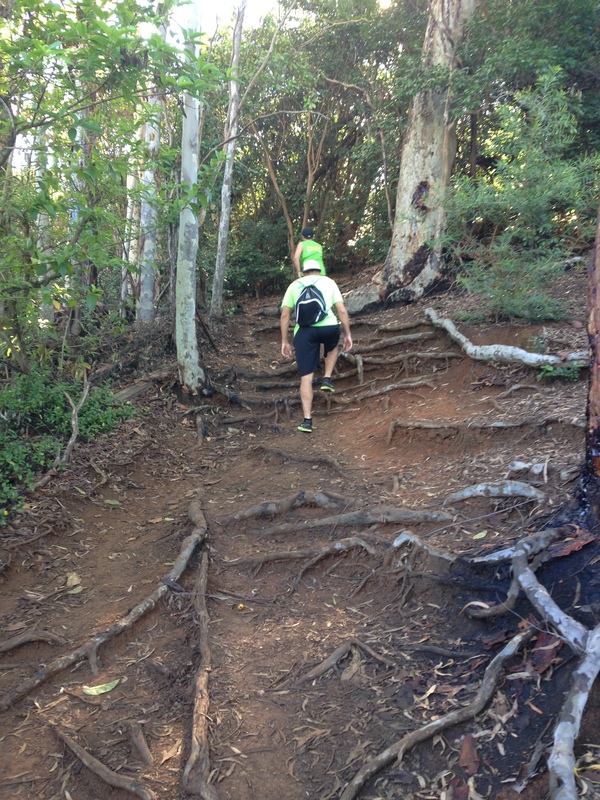 Looking for a great family hike to do on Kauai? 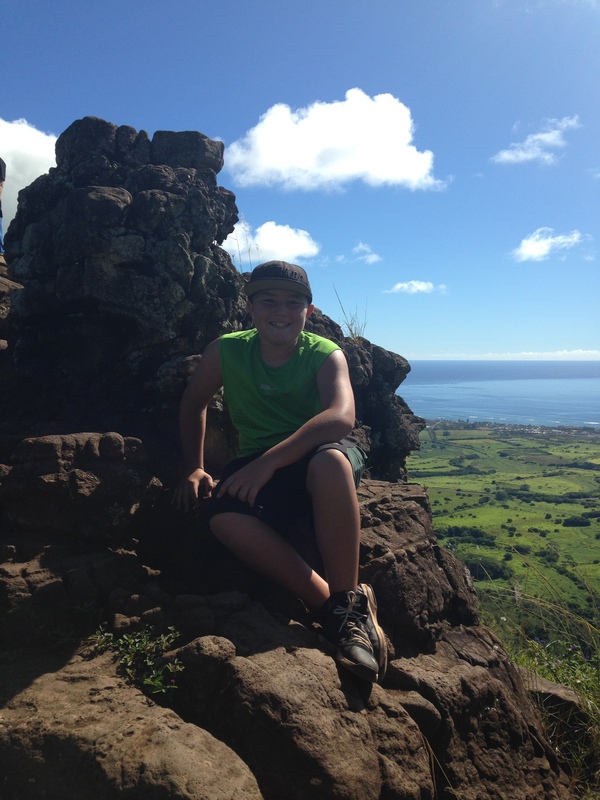 The Nounou Trail, AKA Sleeping Giant, is a fun, family friendly, scenic hiking trail with two access points (east & west) leading to the top of the mountain. 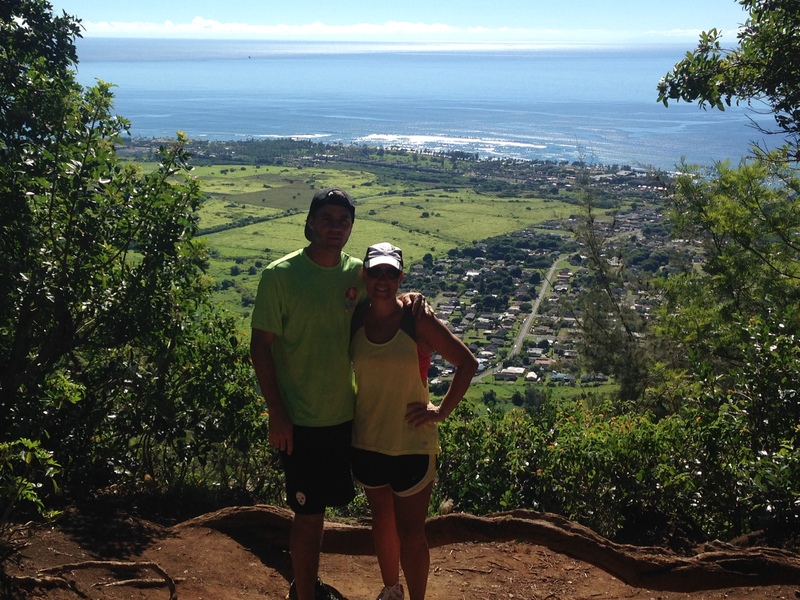 Hike two miles up and two miles back through the Nounou Mountain Range between the towns of Wailua and Kapaa on the island of Kauai. Hike among the Norfolk and Cook Pines that were planted in the 1930′s by the Civilian Conservation Corps. 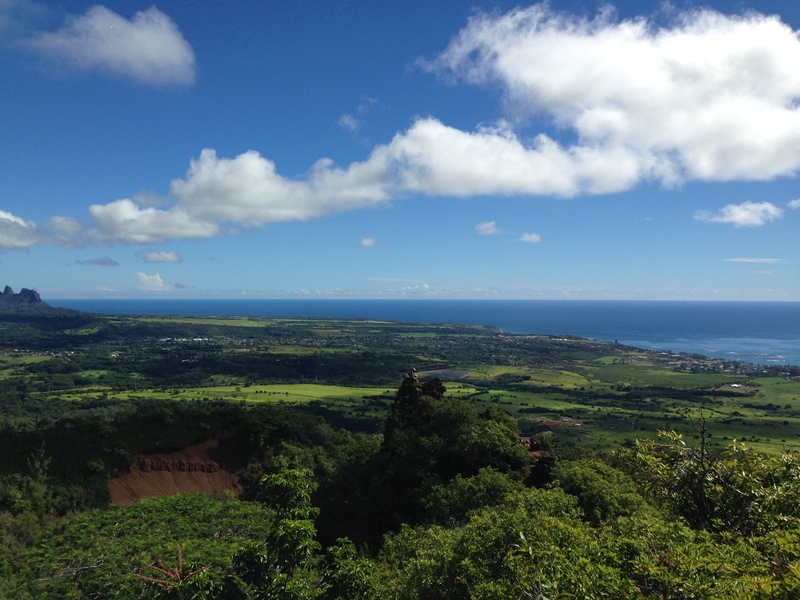 Stop to observe and take pictures of the breathtaking overlooks of Kauai’s lush interior and coastal views. Why is it called Sleeping Giant? According to Hawaiian legend,the giant was tricked by villagers into eating a rocks hidden in fish and poi. After consuming the large meal, the giant took a nap and has never woken. This blog post and pictures are all from the West Trail of the Sleeping Giant. How to get there~If you are not familiar with the area, it is important to take note as to which entrance of the trail you park at the East Trail or West Trail. The East Trail is accessible from Hwy. 56, turn west onto Kuamoo and drive 2.4 miles, the trail head marking will be on the right. For the West Trail, follow the same directions but continue on past the East trail head, turn right on Kamalu Road, drive 1.3 miles and the trail head will be on the right in a rural neighborhood in the Wailua Homesteads. 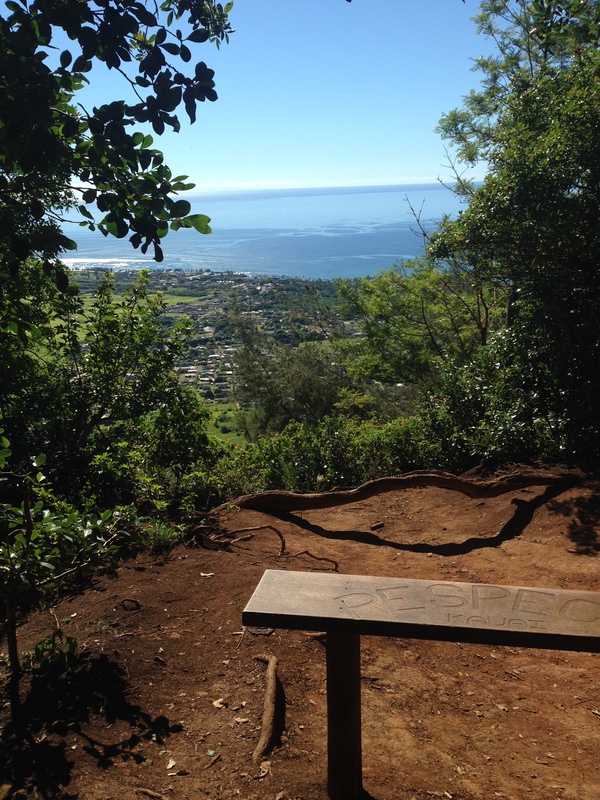 All state trails on Kauai will have a metal sign (pictured above) at the trail head that states the name of the trail. What to expect on the way up~ we started about 8:30 a.m. which is nice and cool in September. Ideally, we could have started sooner as it heated up drastically by 10 a.m. My first tip~ hike at your own pace. It’s not a race, take in the beauty of it all and enjoy yourself. As you make your way up the mountain, it is pretty well shaded. In the picture above, it felt as though we were walking through a foggy mist of trees. It was quiet, peaceful and smelled of fermented cherries. Warning~ there are a lot of fruit flies! Be sure to plant your feet with each step as the smashed fruit on the ground can be slippery. Our son enjoyed picking up walking sticks along the way. Sleeping Giant is a pet friendly trail. There are a lot of dogs. Be sure to have your pet on a leash and bring bags to pick up poop. Some people run the trail, so expect to step aside and allow others to pass. This happened to us frequently along the trail. One trail runner actually passed us three times. 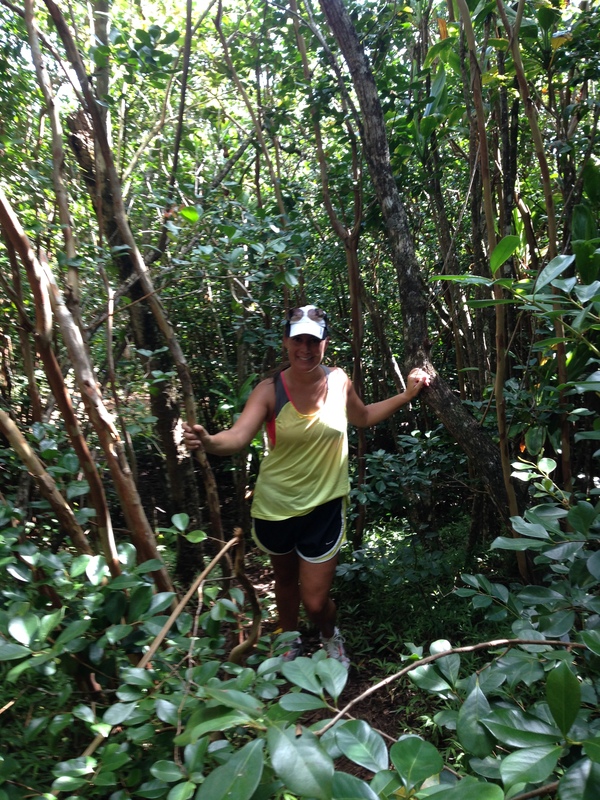 The trail is very safe, people are friendly and most of them will say “Aloha” as they pass. Please respect the trail and trees, pick up your trash and be mindful of others. We took our time on the trail as it was our first attempt and we weren’t in a rush. We completed the entire trail, up and back, in two hours with many stops to take pictures and drink water. If you are an avid hiker, I would imagine you could make it up in 30 minutes time. As you approach the large rock formation towards the top, there is a stretch of the trail with drop offs on either side. Be sure to take your time, not pass others or take pictures in this area. It is a little deceiving as there are bushes on either side of the trail, but when you look closely, it becomes apparent that it is a cliff. I would not recommend that young children hike to the top. There are a couple of spots where we had to climb on large rocks and/or roots. I used my hands while climbing down in a few tricky spots. Wear good shoes, preferably hiking shoes. If you don’t own hiking shoes, wear tennis shoes. Do not wear slippers (flip flops), sandals, brand new shoes or anything with a slight heel. The trail would be an easy place to turn an ankle if not wearing the proper footwear. This was the first large rock that we came upon and of course, we had to take a picture. 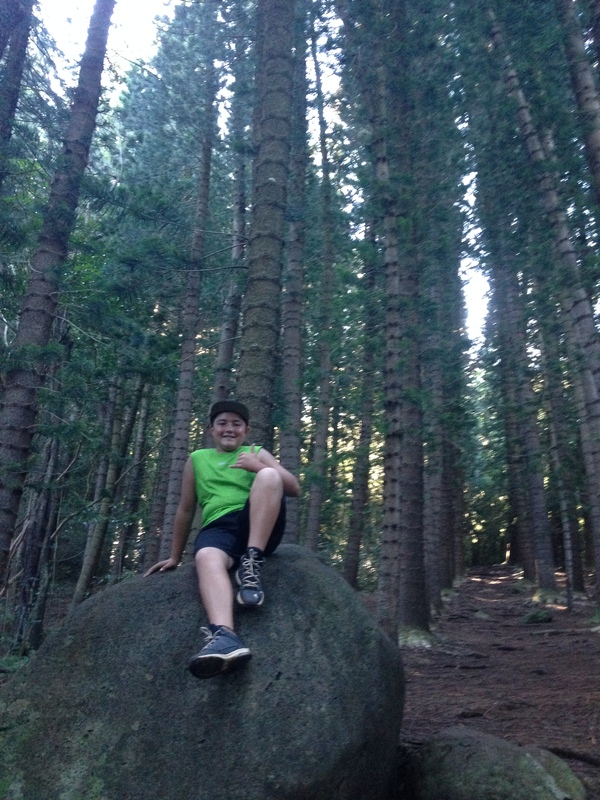 What kid doesn’t love to climb on a great big rock? In this area of the trail, it feels as though you are hiking in the Northwest of the United States rather than on a tropical island. The east and west trail of Sleeping Giant both end up at a picnic table area toward the top. There is a large open grass area. 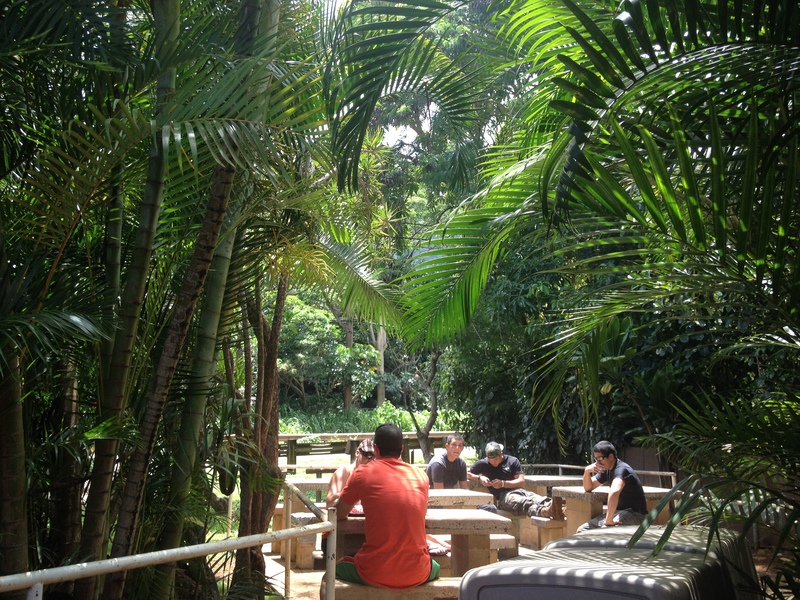 It is an ideal place to take pictures, rest and to stop and eat lunch. There are two covered, picnic tables. Celebrate your climb by enjoying lunch with a fabulous view. The breezes up high on the mountain felt so refreshing after sweating during the climb. There is also a lookout area with a bench, which is a wonderful spot to take a picture. You can set your camera on the timer, put it on the bench and snap away!! 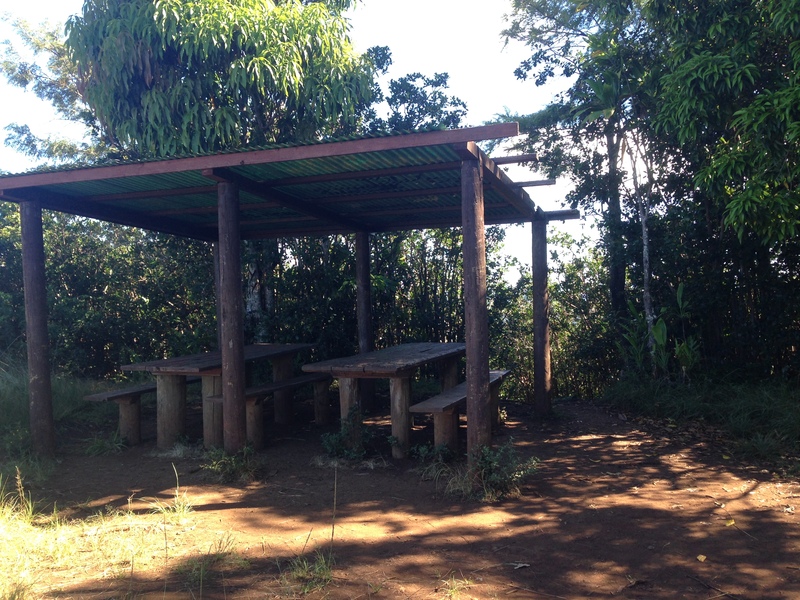 The photo above is from the lookout area. We had our own photographer present that day. Tips: Let me preface by saying that I tend to be over-prepared in most situations. There aren’t any restrooms or water stations anywhere on the trail. If you plan to hike alone, tell someone when and where you will be. Be sure to bring water, sunblock, snacks, wash cloth or small towel, hat and cell phone. We hiked in September when it can be very hot and humid, so be sure to bring at least 3 water bottles per person in a small backpack. Some hikers will advise holding the water bottle in your hand as a reminder to drink often. However, I think you should have your hands free on this trail. Due to hiking in the morning, we didn’t pack a lunch; however, always bring snacks! You never know if/when you or someone you are with may need food. It’s great to snack on healthy food items such as dried fruits, trail mix, granola bars etc. for energy as you hike. We bring a small towel or wash cloth which can be multifunctional. Use the wash cloth to wipe off sweat or to clean off scratches or scrapes which may occur during the hike. It is always best to have a small towel in the event someone were to get injured. It’s wonderful to be one with nature and practice technology-free family time!!!! So turn your cell off if you wish, but don’t hike without it. Keep at least one charged phone with you in the event of an emergency. Lastly, we froze our water bottles which turned out to be a huge relief as I was getting really hot and feeling nauseous at one point and the ice, cool water over my head really made me feel better. Bring your inhaler, Motrin or whatever you usually carry with you for emergencies. Hike safe, be smart and have fun. Verde opened five years ago in Kapaa and has been bringing fresh, original, and authentic New Mexican food to Kauai ever since. 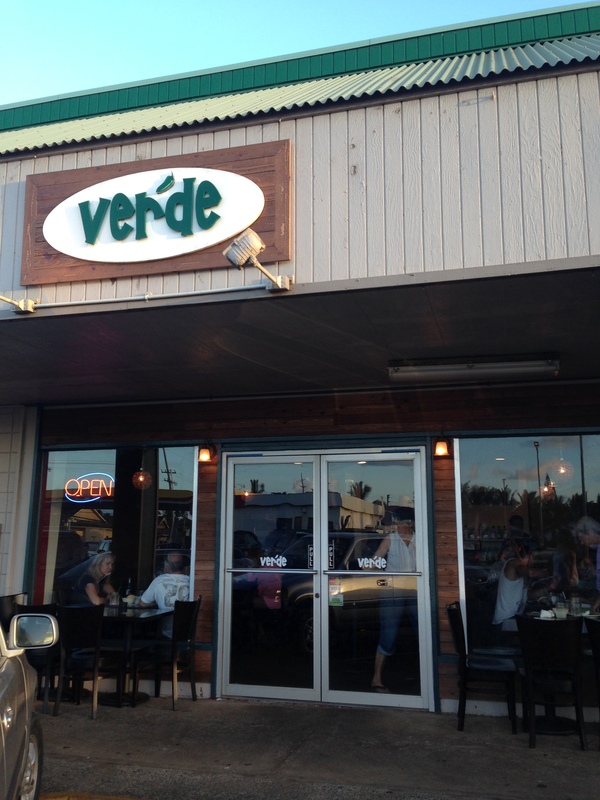 Verde is just a little, hole-in-the-wall in a strip mall in Kapaa located on Kuhio Hwy, but don’t let the outside fool you ~ many locals believe that it is the best Mexican food on island!!!! Often times, Mexican restaurants fill the plate with refried beans and rice which can leave you with that heavy feeling of over eating. At Verde rice & beans can be added to any entrée for just $2.50, but you won’t find refried beans nor rice taking over your plate. If you enjoy sauces, you will love Verde! Everything we ordered was full of flavor and served with lots of sauce. In fact, their sauces are so fantastic that you can find Verde’s Red Salsa and Escabeche (pickled vegetables) at Kauai’s Costco in Lihue!!! The lunch or dinner begins with complementary chips and salsa that keep coming all night! Gotta love that, as we know there are some restaurants that charge per salsa. 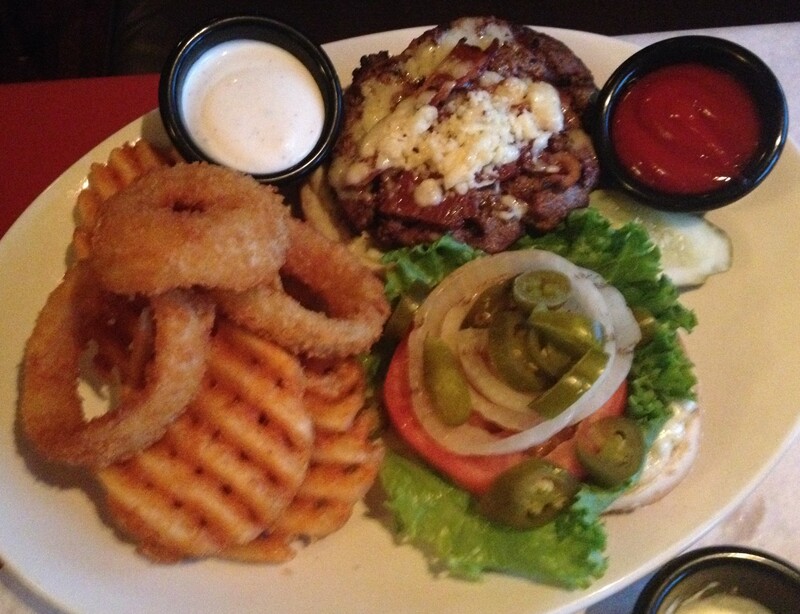 The prices are extremely reasonable with entrées ranging from $8.95-$15.95 and drinks from $5-$9. The House Margarita is amazing with rock sea salt on the rim. 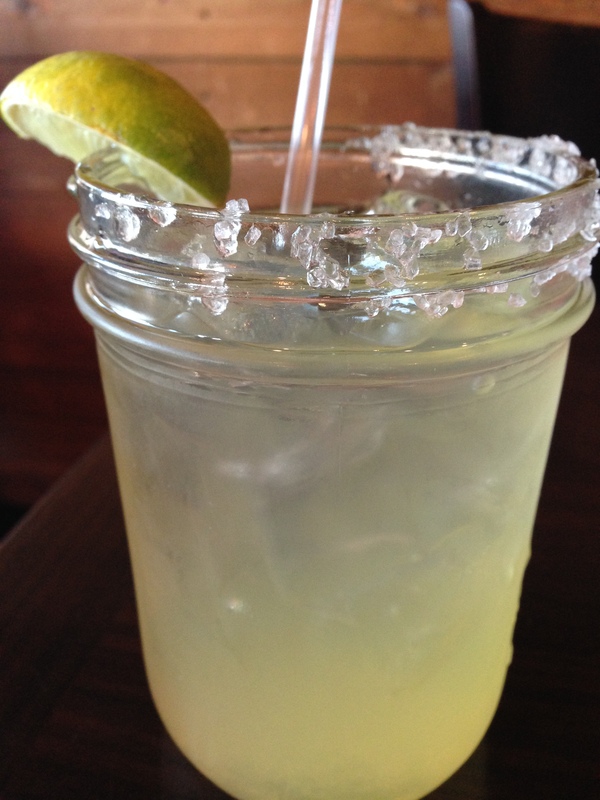 Don’t miss Happy Hour from 3-5 p.m. daily with $3 house margaritas and $3 16 oz draft beers. 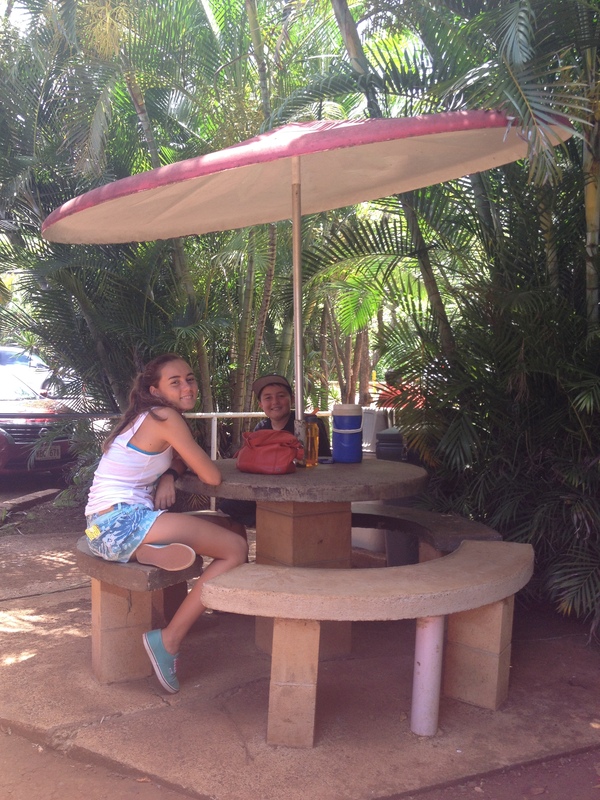 Where else can you get drinks on Kauai for $3??? NOWHERE! Verde also has a Keiki (kids) menu available with vegetarian options for #3.95-$5.95. Meat can be added to any Keiki meal for $1.95. If you can’t select just one menu item, order several and share with friends, highly recommended. 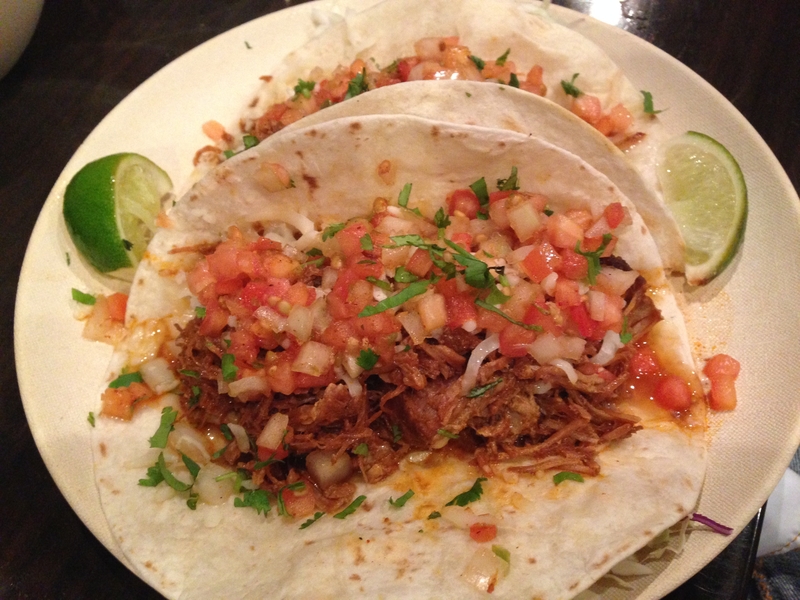 On the menu choose from salads, tostadas, tacos, burritos, enchiladas, and quesadillas. Order the burrito “wet style” for an extra $1.95 which includes red or green chile sauce or both cheese, lettuce & pico de gallo. The Garlic Shrimp Tacos (pictured) are served with a spicy sauce of roasted garlic-chipotle aioli, guacamole, cornmeal-crusted shrimp, cabbage, guacamole, and pico de gallo. 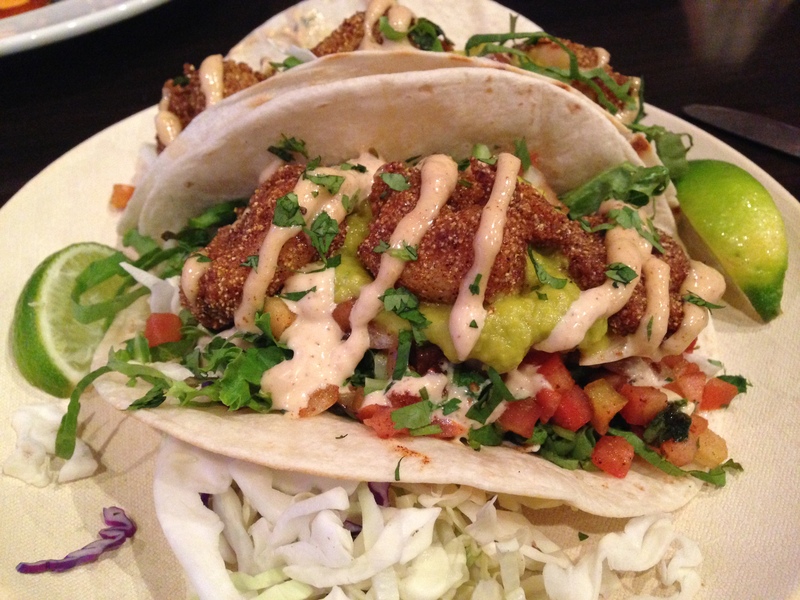 In addition, the menu has seared rare ahi, fresh catch, pork, ultimate chicken, carne and vegan tacos. The Ahi Tosatada (pictured) is probably one of the prettiest dishes served at Verde. It’s more of a salad than a traditional, heavy tostada served with two sauces, the red chile sauce & aioli. The ahi is seared rare and served with guacamole, pico de gallo, and local greens on a corn tortilla. This is a light dish but large enough for sharing. Verde is a fabulous place to celebrate a special occasion. The restaurant is pretty small, with a great use of space. 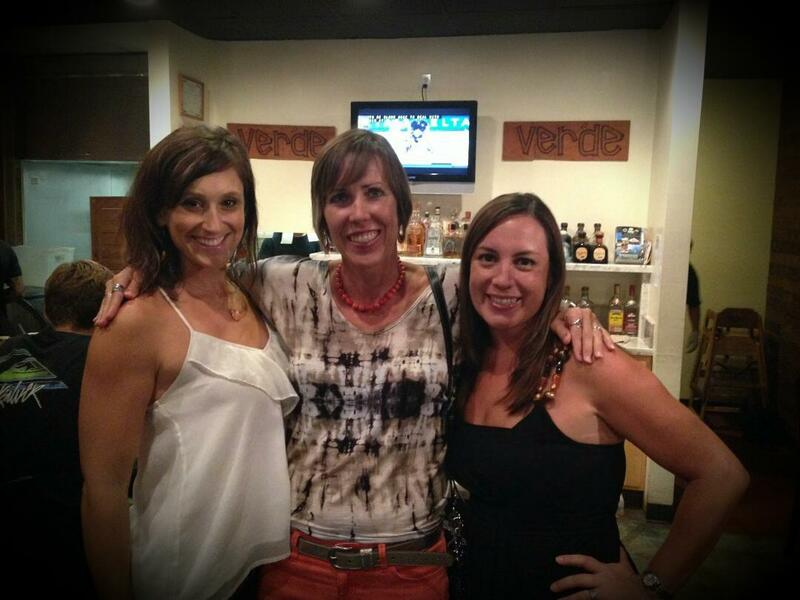 We recently celebrated a birthday at Verde with a party of 5 people. 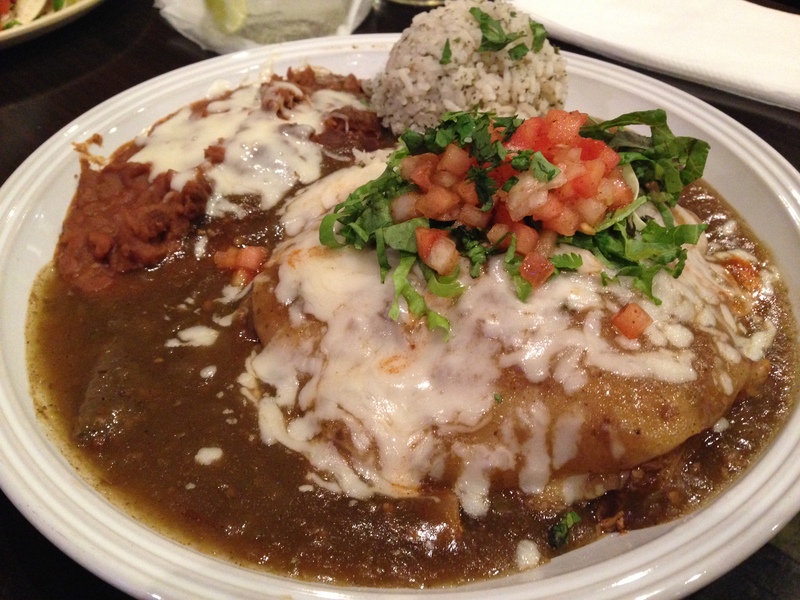 Look for Verde’s signature dishes on the menu, including Stacked Enchiladas made with pork/beef/chicken/fish (pictured), Veggie Stacked Enchilada, Huevos Rancheros, and Chicken Posole. Posole (pozole) translates to “hominy” and is a type of stew/soup made with maize and typically some meat such as pork, chicken or turkey, chili peppers along with garnish. Don’t leave without ordering sopaipillas & honey for dessert!!!! What are sopaipillas? The word (Germanic) actually translates to “bread soaked in oil”, better described as a fried puffed pastry dough similar to that of a doughnut. Sopaipillas are commonly served as a dessert with honey in Texas, Colorado and New Mexico. In Peru they are larger and thinner, known as cachanga and often served at breakfast sprinkled with cinnamon. Sopaipillas are served in Chile (sopaipas), Bolivia, Argentina (sopaipa/supaipa/torta frita, Kreppel), and Uruguay. In Chile, pumpkin is added to the dough and served with a sauce of onion, tomato, garlic and herbs. 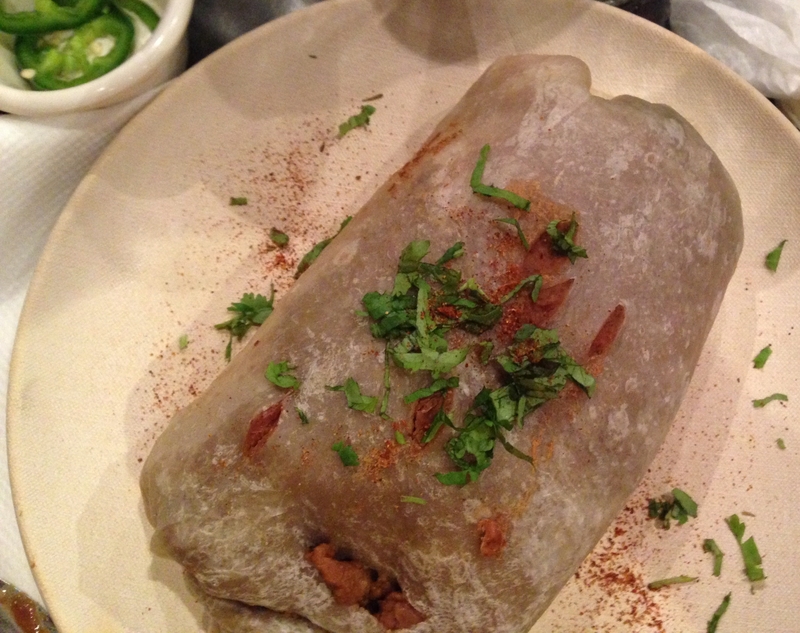 In New Mexico, sopaipillas may be served in place of bread with dinner or stuffed with ingredients similar to that of a taco. 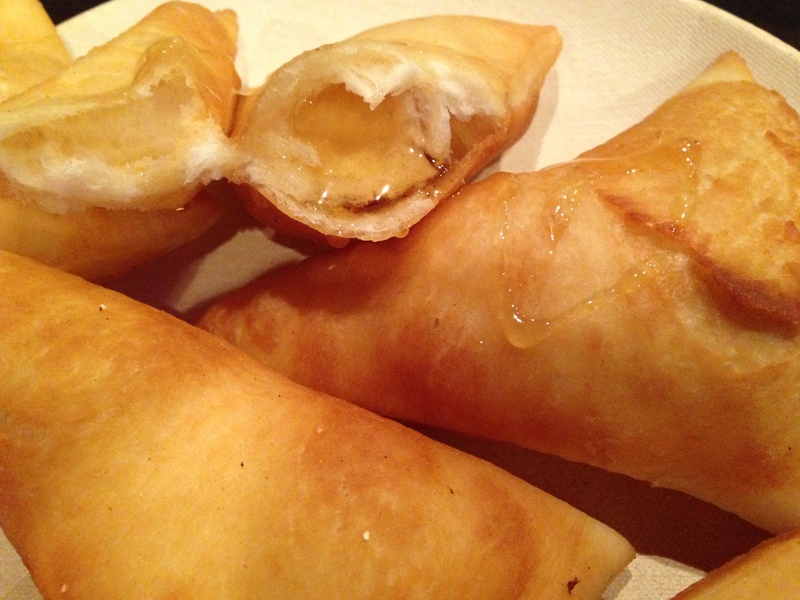 Verde serves sopapillas either as dessert with honey or as a meal stuffed with meat or veggies, cheese and sauce. We ordered them for dessert, served hot, light and airy, not greasy. The picture says it all ~ no words needed. This year, for our anniversary, we wanted to indulge in a new dining experience. 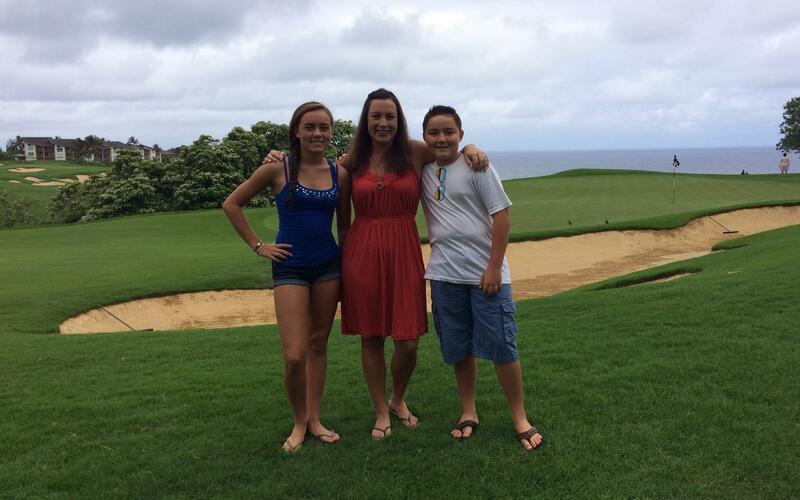 After ten years of living on Kauai, we had not been to Postcards Café in Hanalei. We had heard rave reviews about Postcards Café, which opened in 1996, but had not yet experienced it for ourselves. Many people describe Postcards as a vegetarian/vegan restaurant with amazing seafood options. The majority of the entrées are vegan, void of any eggs or dairy along with several gluten-free options. In addition, you will not find meat, poultry, or refined sugar on the menu. One thing for sure, Postcards Café is known for their impressive prepared and displayed seafood. 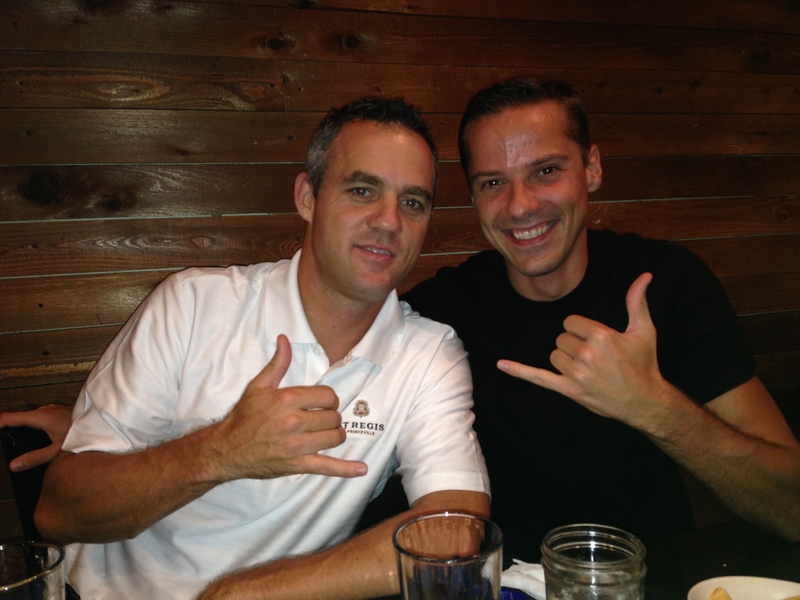 All meals include several organic side dishes which are island-grown and organic. Postcards is a fine dining experience with a local café feel. If you appreciate ingredients such as fennel, coconut, roasted beets, truffles, leeks, mirin, teff tortillas, tomatillos, Kaffir lime, Shitake mushrooms, cashews, and pumpkin seeds, then Postcards Café is sure to please. 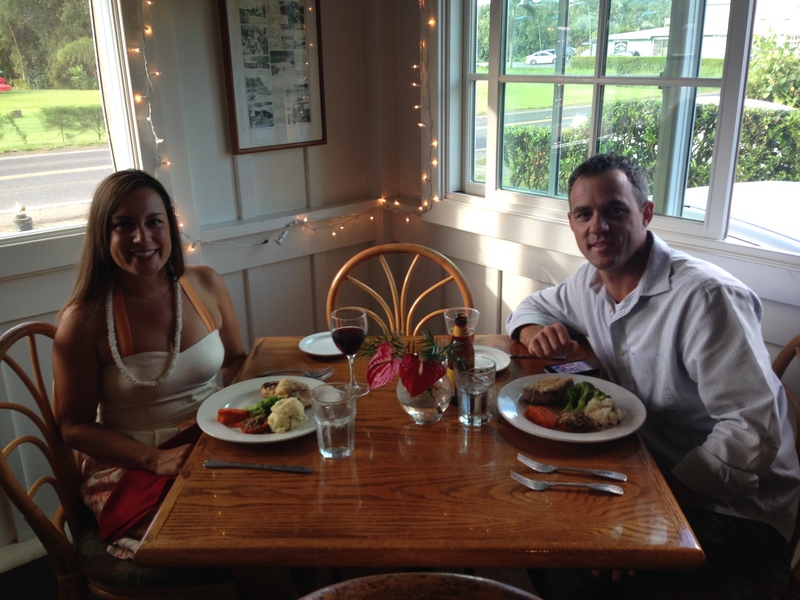 Start off the evening with a romantic, scenic drive to Hanalei town. 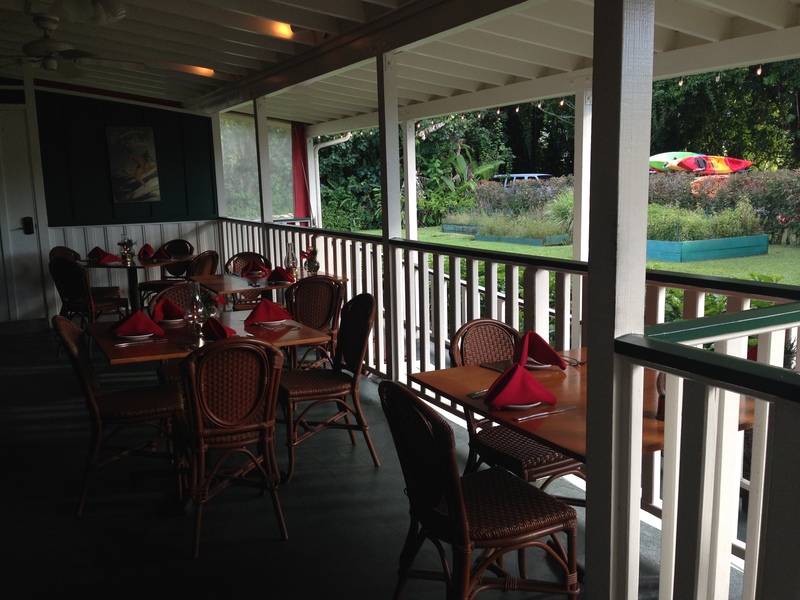 Drive along the Hanalei river on your right and just as you come into the little town of Hanalei, Postcards Café will be located on your left hand side. Just a blink and you will drive right past it. 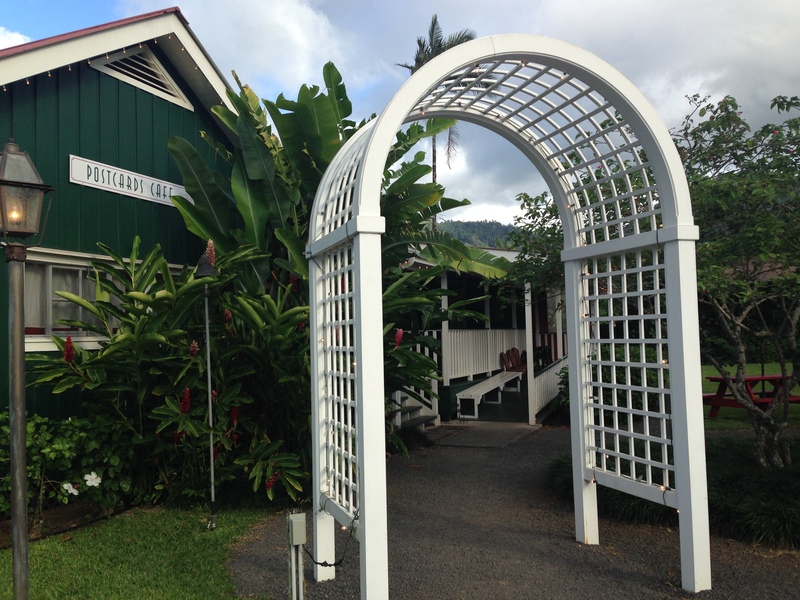 Make your way through the white, wooden arch located at the entrance and find yourself at the plantation cottage lanai surrounded by tropical plants swaying in the breeze. When dining out, we always look for unique features. Postcards Café is a quaint restaurant displaying great use of their small space. 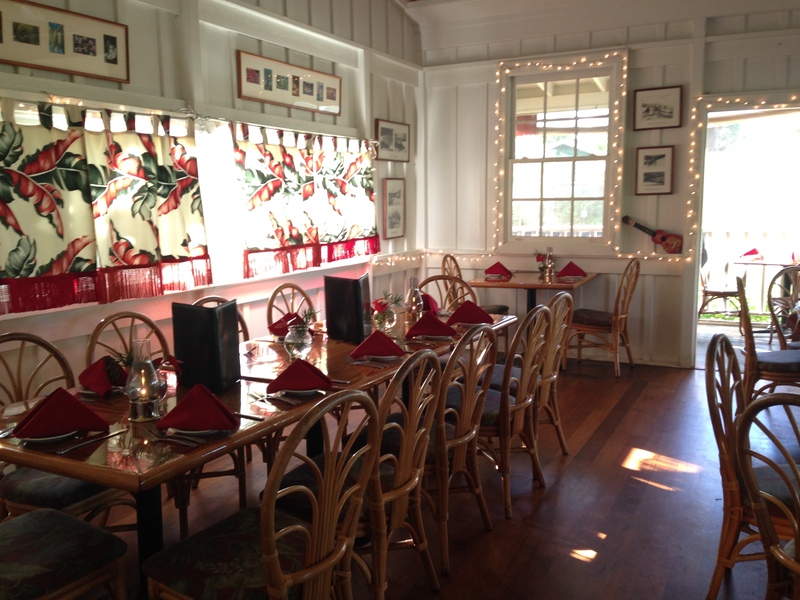 With three options for seating, customers may dine on the outside lanai with mountain views amongst the tropical plants, inside with an intimate ambiance and a plantation feel, or on the screened-in lanai facing the town of Hanalei. We had the pleasure of sitting inside as a wedding reception was taking place. We felt as though we were part of the reception, listening to the father’s speech and toasting with the bride and groom. 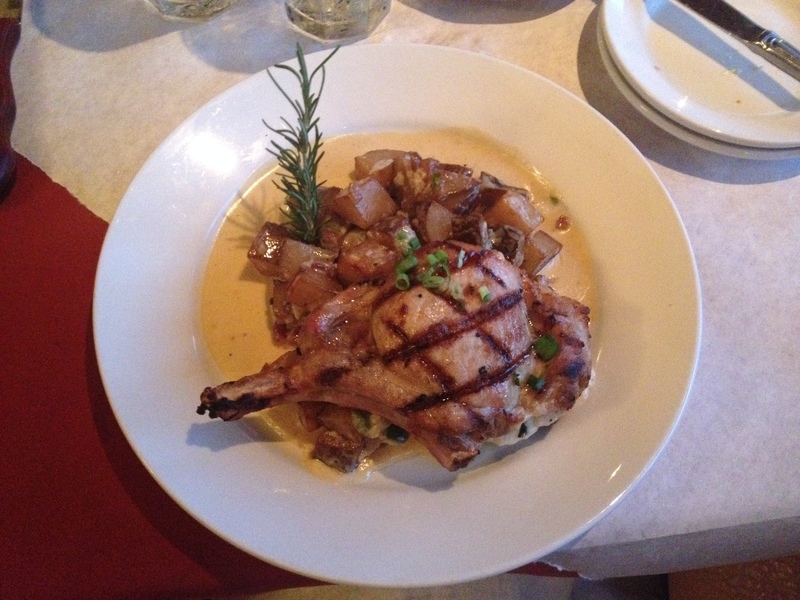 The wait staff is highly knowledgeable about all of the fresh ingredients in the entrées. 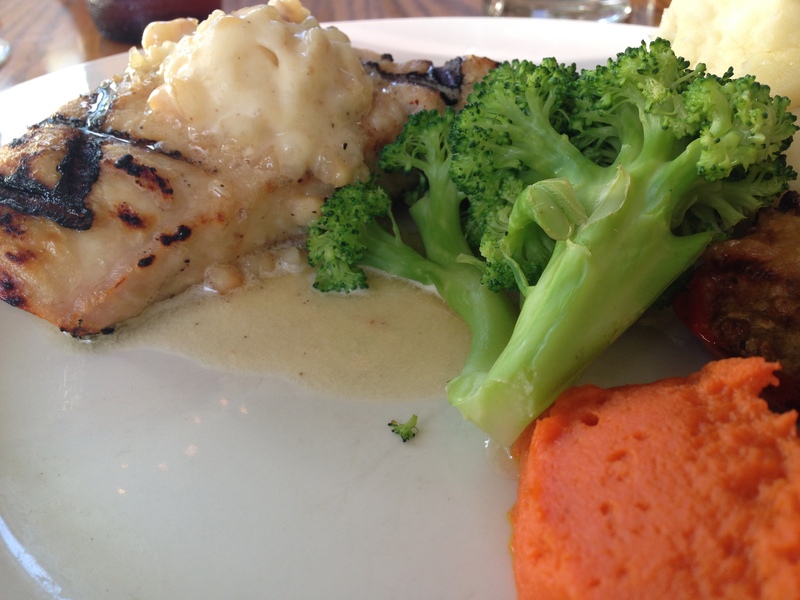 Our server went over the fresh fish of the day and the various ways to have it prepared. 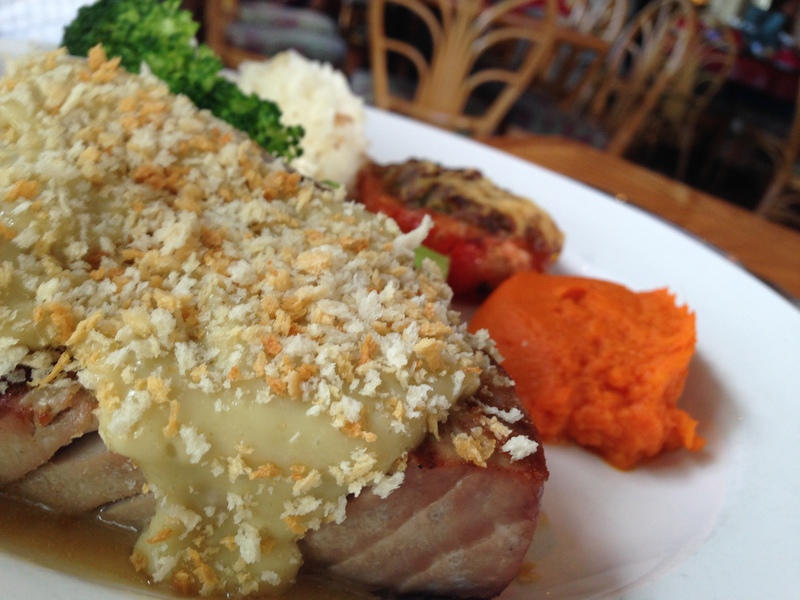 She recommend the Fresh Island Fish entrée grilled with macadamia nut butter. The fresh fish is prepared either grilled or blackened with macadamia nut butter, herbed citrus or peppered pineapple sage. The vegetables are beautifully prepared and displayed. I don’t know what I was more impressed with, the fish or the vegetables. It is not often that I dine someplace and rave about the vegetables served on the side. There were three vegetables sides served with the fish, generous portions. My favorite was the mashed sweet potato, fluffy, rich and creamy. Monchong is a firm fish which can be dry if not grilled properly. It was grilled to perfection and the char flavor was evident. Monchong is a great protein option as it is low in saturated fat and sodium. It is rich in niacin, vitamin B6, vitamin B12, phosphorus, and selenium. I ordered a lovely glass of Pinot Noir with the Monchong and it went very well together. For the entrées choose from Fennel Crusted Lobster Tail, Fresh Island Fish, Fusilli Pasta with Shrimp & Fish, Wasabi Crusted Ahi, Tandoori (Indian), Teff Tortillas layered with Grilled Vegetables, & Thai Coconut Rice Noodles with Kauai Shrimp Broth. Okay, now you choose!! Wasabi Crusted Ahi not to disappoint! 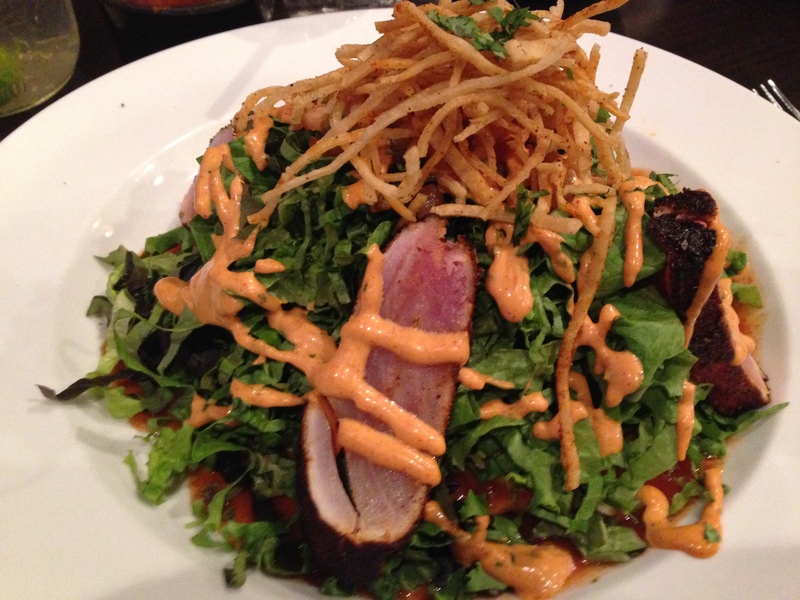 We order the ahi seared medium. The fish was so moist that you could cut it with a fork. The wasabi cream sauce was not too pungent, albeit you would need to be fond of wasabi. It was not spicy hot, rather a smooth kick with each bite. The herb crusted, warm tomato slice was very different and complementary to the seafood. We choose the jasmine rice option over the mashed potato. Bliss…. The picture really says it all, no words needed. The dessert menu is out of this world, offering scrumptious items such as The Chocolate Volcano (made with pure organic cacao) pictured above, Lilikoi Mousse, Chocolate Silk Pie, Coconut Caramel Sundae (pictured), and the Banana Bliss served with sorbet. 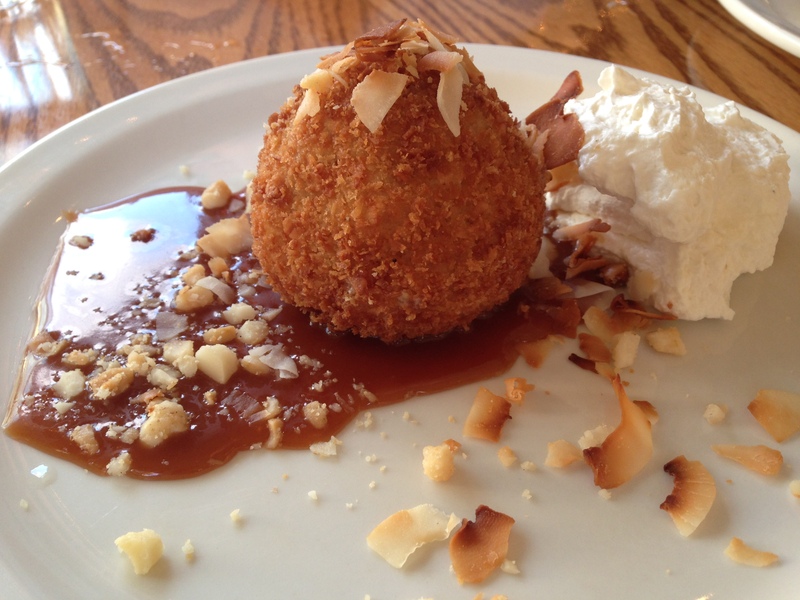 Hands down, the Coconut Caramel Sundae is one of the most uniquely delicious desserts I’ve ever had, made with coconut-crusted macadamia ice cream and salted caramel sauce. I wish the caramel sauce were for sale. It was thick, but not gritty and the macadamia nuts mixed in the caramel was OTT (over the top) amazing. The sauce on the Chocolate Volcano dessert plate was to die for. I wish we could have tried all of these desserts. Postcards Café is open daily for dinner starting at 5:30 p.m. Sometimes you just crave that good ‘ole country food with homemade barbecue sauce, steak sauce, meat with the grill marks on it and grilled potatoes. 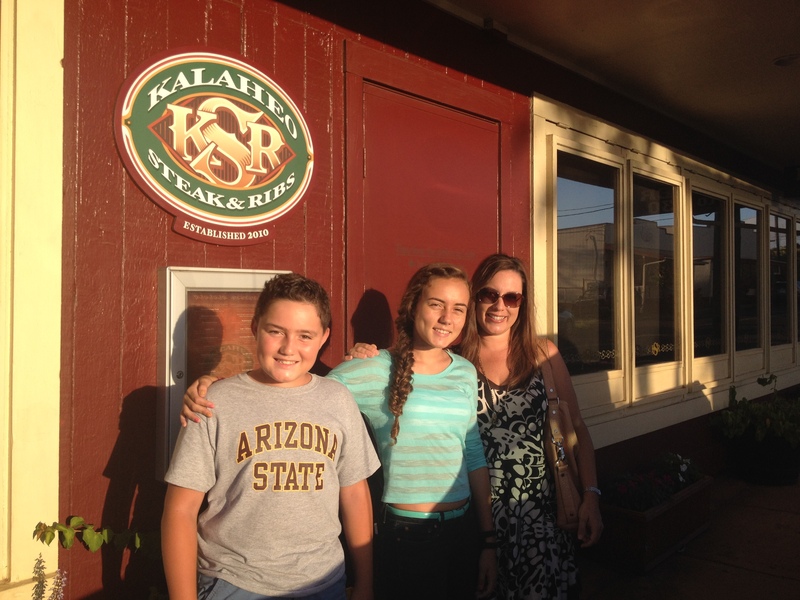 After 11 years of living on Kauai and hearing so many great things about Kalaheo Steak & Ribs, we finally decided to take the kids! 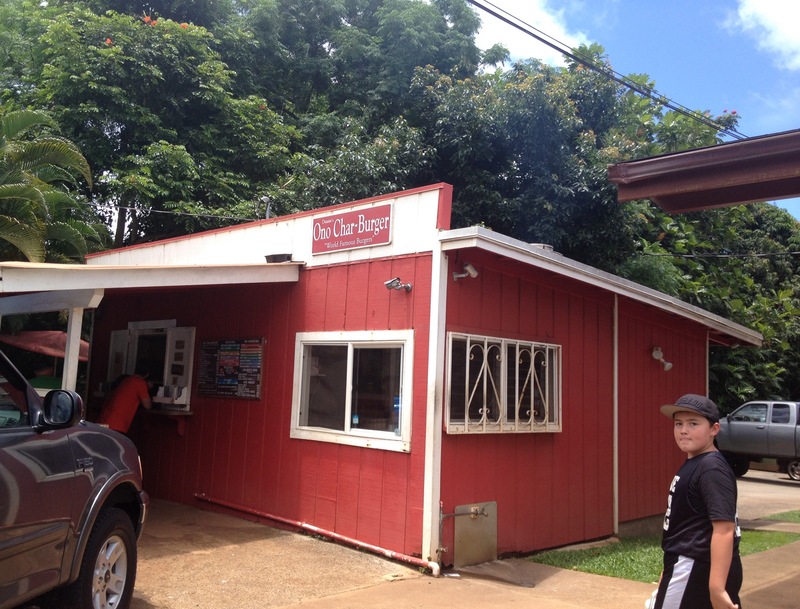 Kalaheo Steak & Ribs is located in a historic building at 4444 Papalina Road in Kalaheo on the west side of Kauai. 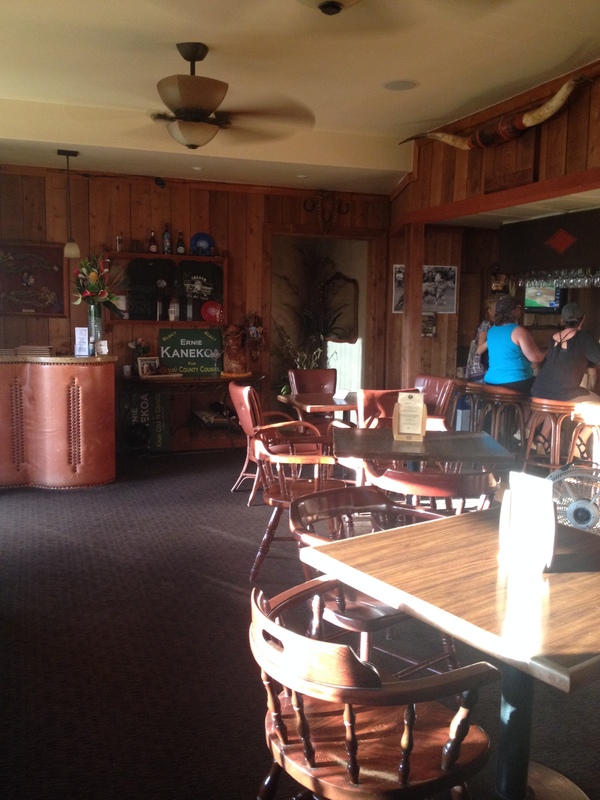 The restaurant has been in existence for over 30 years and was originally named the Kalaheo Steak House.When you first enter the restaurant, you will walk right into their saloon. The saloon is a happen’n place where you will find karaoke on Friday/Saturday evenings and live music on Thursday/Sunday evenings. It has the feel of a real saloon, minus the dust on the floor. Complete with horns on the ceiling, wood siding throughout and my favorite, the pictures of Kalaheo from the 30’s & 40’s in sepia and black & white. Step into the feel of a true steakhouse, with dimmed lights and paniolo decor. The restaurant is filled with booths and wooden tables. 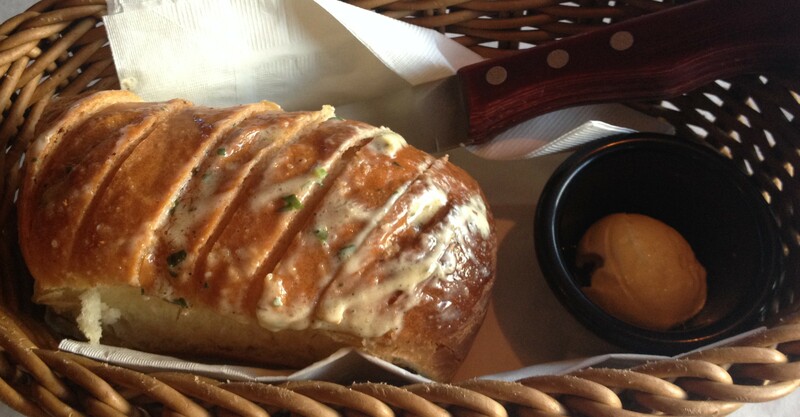 Let’s talk food~ for starters the waiter will bring a basket of bread covered in garlic butter. May very well be the best bread I’ve ever had. Clearly not low in fat, the bread smells amazing before you take the first bite. Of course, I took a photo so that your mouth would water. I am one of those people who really expects hot bread brought to the table whendining at a nice (pricey) restaurant. I love bread with my food! Just be careful not to fill up on the bread which keeps coming throughout your meal. I also appreciate that, not having to ask for more. 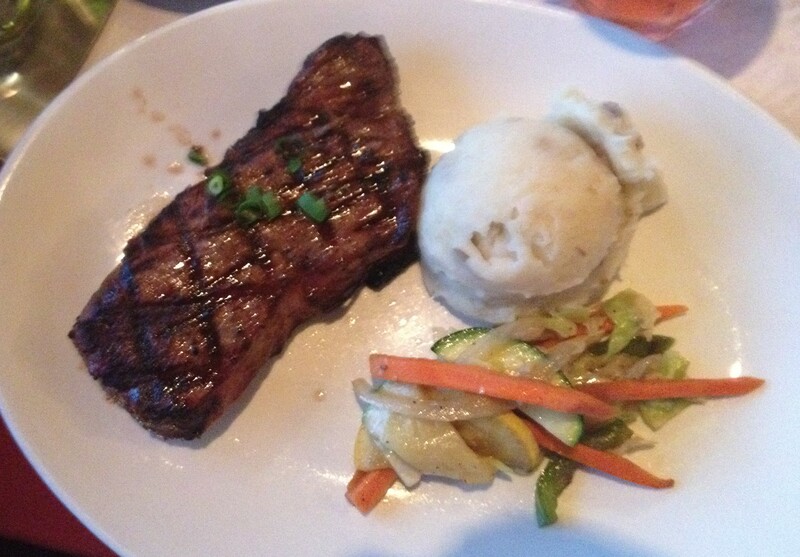 Usually a steak house is known for their hearty meals, steak and other special cuts of meat. However, Kalaheo Steak & Ribs had a very diverse menu for a steakhouse. For those of you who don’t eat red meat or pork, try the calamari, poke (raw ahi), stuffed mushrooms or steamed clams for starters. Non-beef or pork entrees include Chicken Picatta, Fettucini Alfredo, Pasta Marinara, and Fresh Kauai Water Fish. All entrees are served with a salad and a choice of mashed potato, baked potato or rice. Let me add that the mashed potatoes have chucks of the skin from the new potatoes, which I love!!! Since my family is made up of carnivores, those are the only pictures of food that I have. Pork can be so dry if not prepared properly. I ordered the Pecorino Cheese Stuffed Pork Chop (pictured above), which was to die for. The sauce over the pork chop and potatoes made the entire dish! The pork chop was stuffed to perfection, not too much cheese oozing out but enough to taste the flavor. For those of you who are “burger people” (there is one in every family), Kalaheo Steak & Ribs has a Gourmet Paniolo Burger made with top-quality ground round, apple wood bacon, aged white-cheddar cheese, grilled onions, jalapeno peppers, tomato, lettuce, and aioli on a sesame seed bun. Steak, steak, steak. 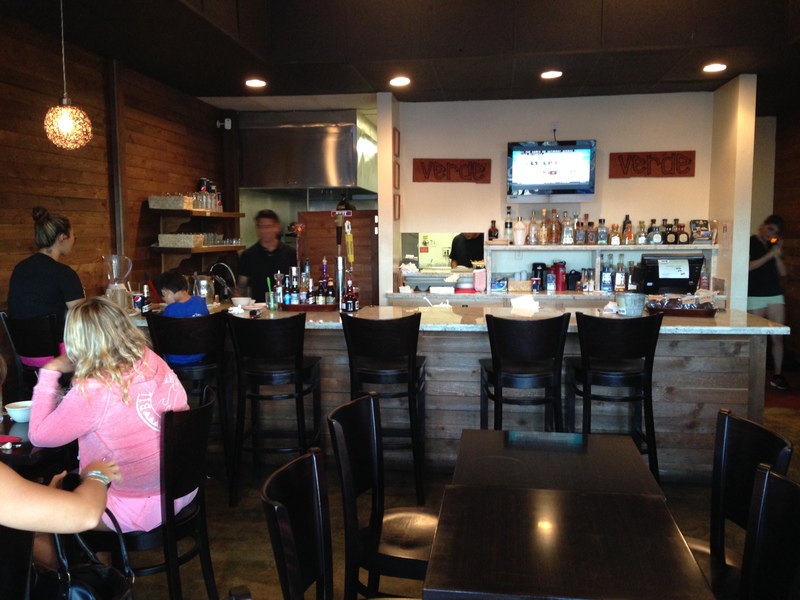 We must talk about the steak and ribs at Kalaheo Steak & Ribs. We ordered both!! 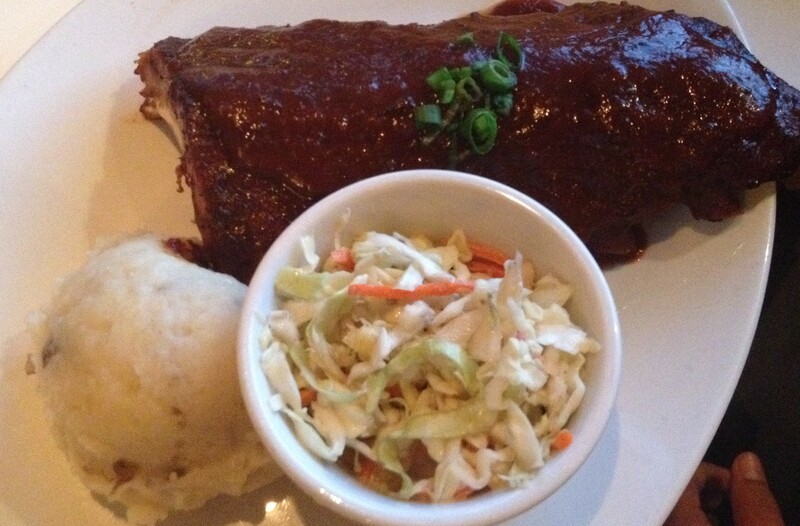 The baby-back pork ribs fall off of the bone and are served with hickory cranberry BBQ sauce and island-style slaw. For the steak choice, we opted for the Rib Eye over the Filet Mignon. The portion was large and cooked perfectly, as requested. This is one of the few restaurants where everything that we ordered was wonderful. 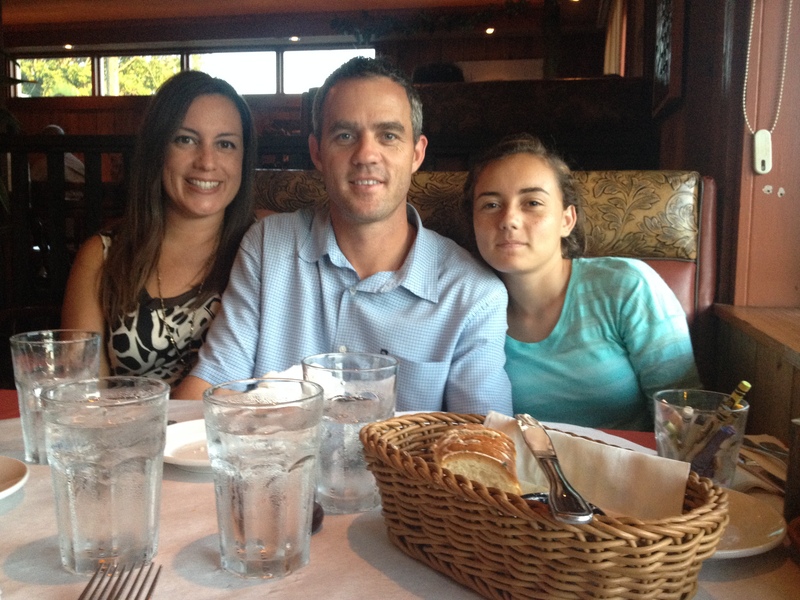 We didn’t have any complaints about the food and the service was fabulous! Don’t forget to save room for dessert! 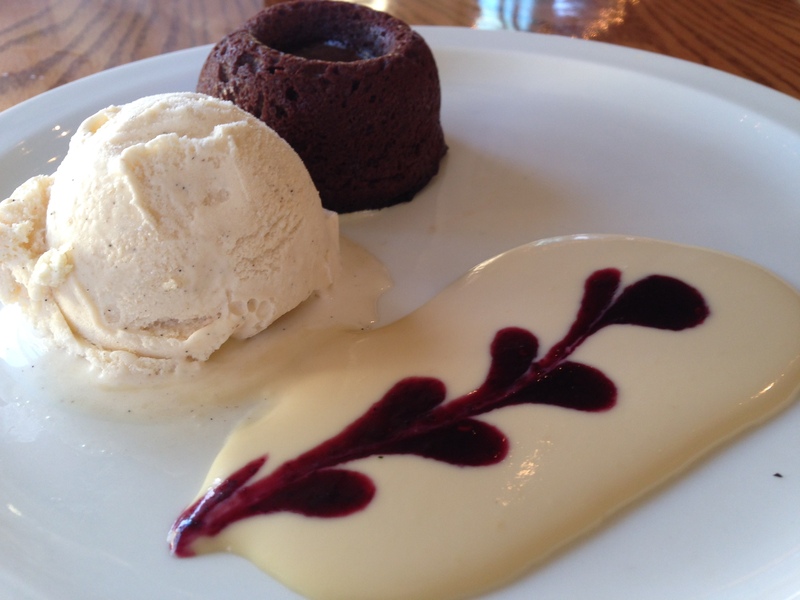 The dessert menu offers delicious local favorites such as Coconut & Chocolate Pie, Heavenly Hana Ice Cream Pie, Molokai’i Sweet Bread Pudding, and Lappert’s (locally made) Vanilla Bean Ice Cream. Kalaheo Steak & Ribs is open Tuesday – Sunday from 4:00 to 10:00pm with Happy Hour from 4:00pm to 7:00pm and Dinner from 5:00pm to 9:30pm. $$ Saving Tips~ The portions are fairly large, so it is a great place to split entrees! Order an appetizer and split a meal. The bread keeps coming, so you will not leave hungry. We each took home doggy bags. Try and arrive just before Happy Hour ends so you can order a drink with your meal at a discounted price. Kalaheo Steak & Ribs does have kids menus. Vacation is something to look forward to, a much-needed break, time for R&R, but when traveling with a family, kids or grandchildren ~ a hotel room can prove to be challenging. With only two beds, a tv and a bathroom, the space turns into kids jumping from bed to bed or teens fighting in a confined area. Now, the idea of vacation has just completely taken a nose dive. This post is not to promote the purchase of timeshare, but merely to outline the benefits of timeshare vacationing whether you purchase or simply book a night. We absolutely LOVE to stay in timeshare units for several reasons. Most timeshare units are extremely spacious, including multiple rooms, washer & dryer in unit, fully stalked kitchens, towels, BBQ utensils, and ice chests. The convenience of more than one TV in the unit is nice. This allows the parents to watch one show while the kids watch a movie in the living room. You never know when the weather may turn and you find yourselves indoors watching movies all day. Timeshare properties are in constant competition with other timeshare properties; therefore, the amenities just keep getting better!!! Expect spacious balconies, which is the perfect spot to eat breakfast, watch birds, have a glass of wine or, at the Westin Ocean Resort Villas, watch golfers play on the Makai Golf Course or simply view the ocean waves roll in. 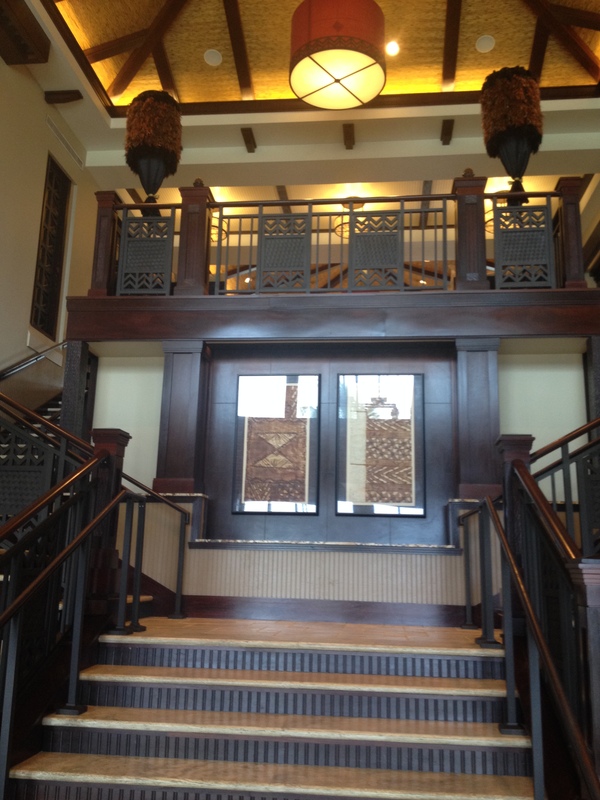 The Westin Ocean Resorts Villas are located in Princeville on Kauai’s north shore. The units at the Westin set up high on the north shore, overlooking the ocean; however, there is not an accessible beach from the resort itself. 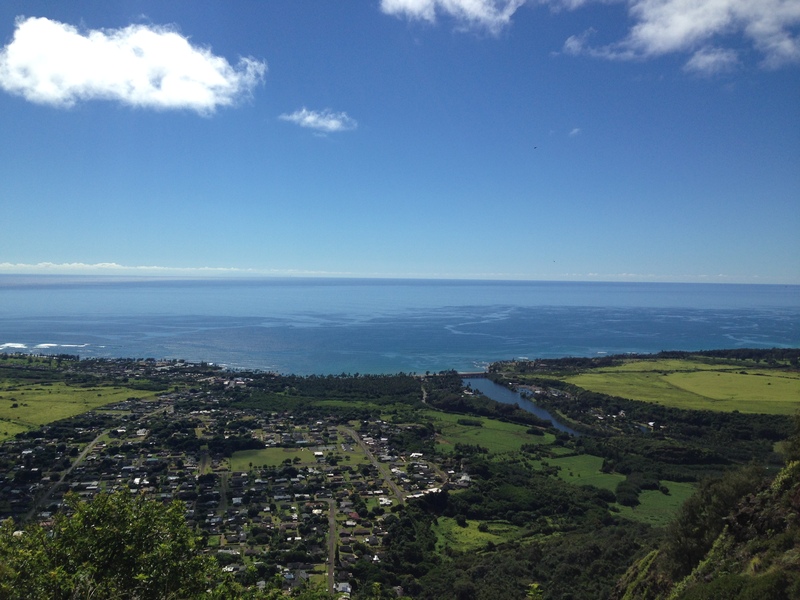 Gorgeous Hanalei Bay is just 3.8 miles up the road. The Westin has multiple pools, bbq’s overlooking the ocean, pool tables, state-of-the-art gym, on-site market, poolside bar, pool wait staff, ocean front massage cabanas, restaurant, multiple hot tubs, ping-pong tables and much more. It is the perfect place to stay and not have to leave for any reason. If you already live near a beach and you just want to get away without having to leave once you get there, this is the place! 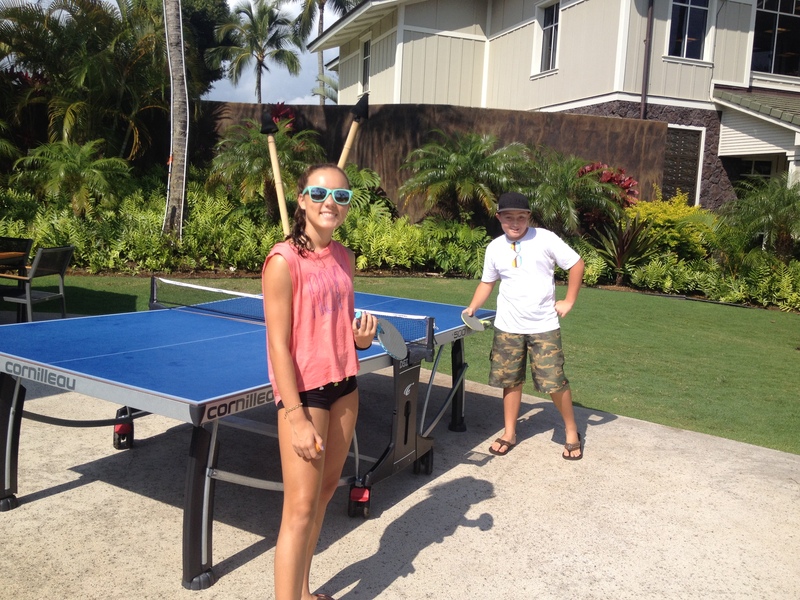 The ping-pong and pool tables are a great way to enjoy family time. We took turns, teaming up with boys against girls and adults verses kids. It gives families a chance to have healthy, competitive fun. Stay active- get moving! The gym at the Westin is a state-of-the-art fitness facility which includes Life Fitness equipment. The fitness center is glass, allowing each guest an ocean view while exercising away. The fitness center has complimentary, chilled water and towels for an after workout shower. Since vacation is all about relaxation, let’s talk about the pools. The Ocean Resort Villas have 4 pools. The Main Pool (pictured above) is a multilevel pool surrounded by lounge chairs with straw covered bungalows. 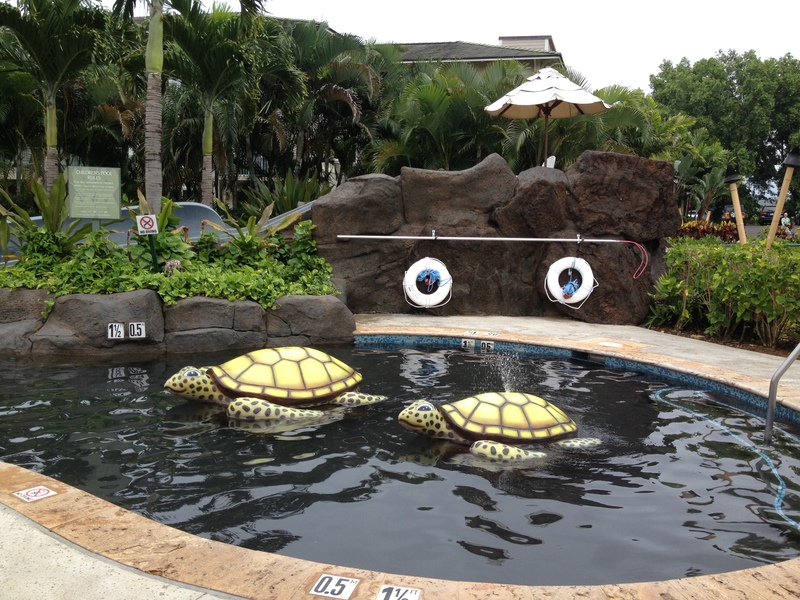 Little ones will love to splash around in the Keiki (children’s) pool which has a small slide and two turtles to climb on. 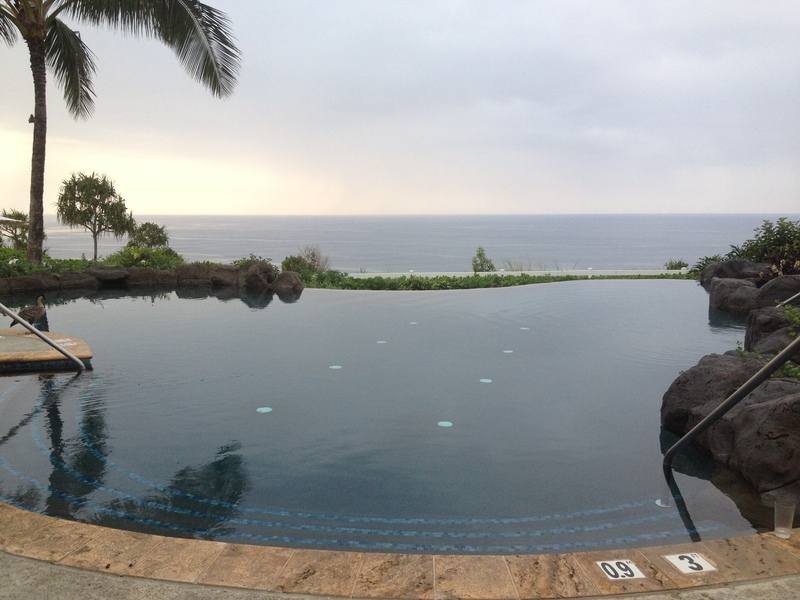 There are two other plunge pools located around the resort. 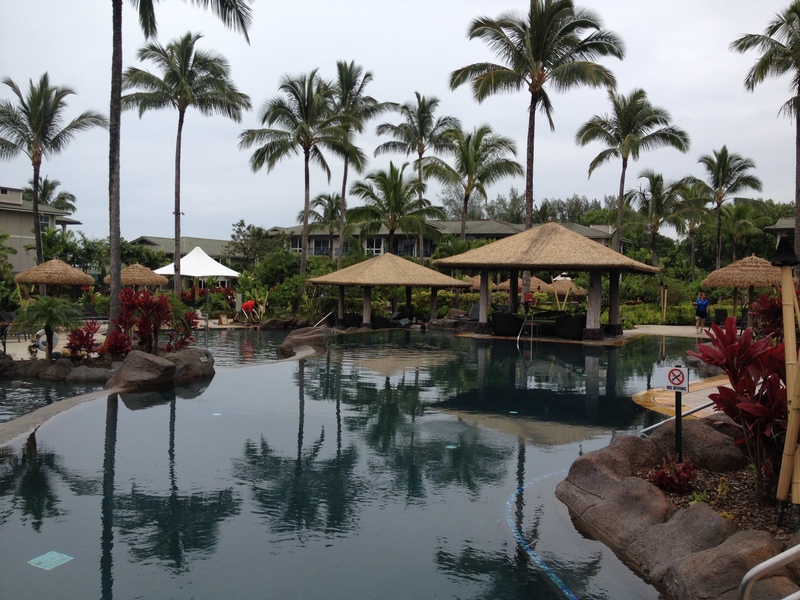 The resort is quite spread out, so it is nice to have pools located throughout. 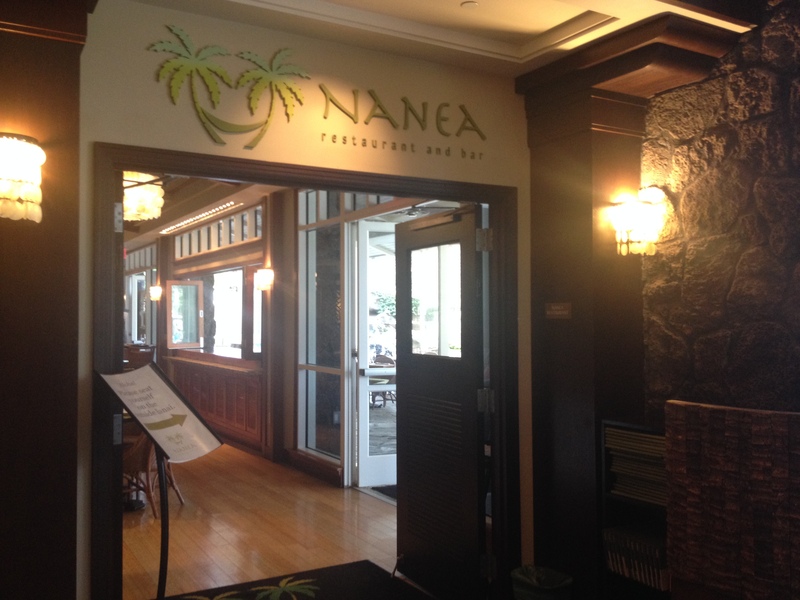 Nanea is the main restaurant on property, serving breakfast, lunch and dinner daily with a brunch on Sundays. Enjoy dining in the open-aired dining room or outside on the terrace. Gluten-free and vegan options are available on the menu. Nanea Restaurant and Bar offers a 5 course tasting menu with wine pairing. 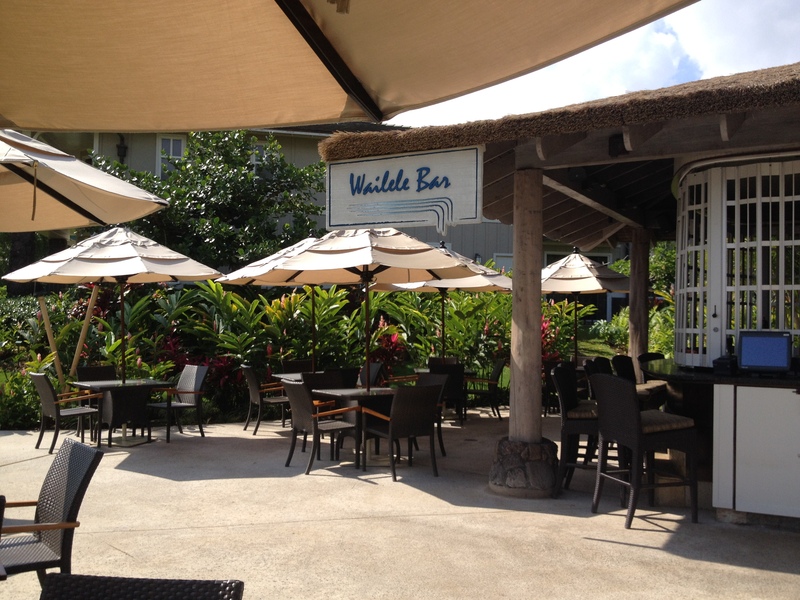 When lounging poolside, order lunch from the Wailele (waterfall) Bar and have it brought to your chair. While eating lunch or sipping on a tropical cocktail, there are views of three waterfalls atop surrounding mountain peaks. 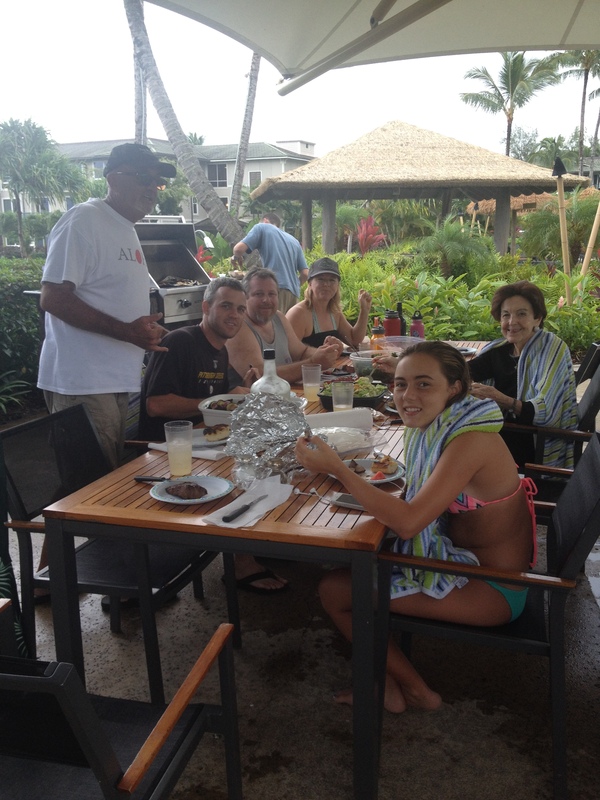 Our favorite amenity at the Westin Ocean Resort Villas are the bbq’s!!! It doesn’t really feel like cooking when you can enjoy an ocean view while lounging poolside. Relax in the whirlpools while your food is grilling away. When the food is ready, sit outside and eat as a family, sip wine and play games. 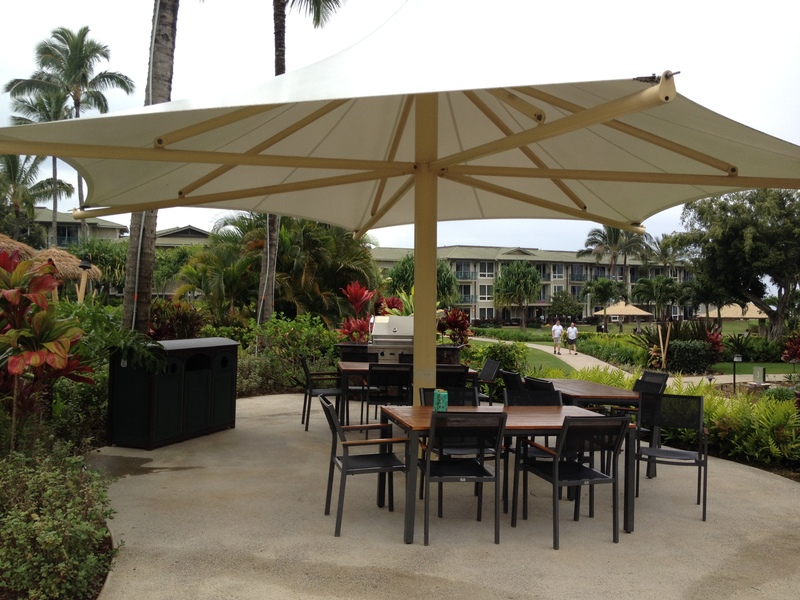 Some of the outdoor eating areas are covered for the occasional passing shower. We spent every evening outside grilling different foods. 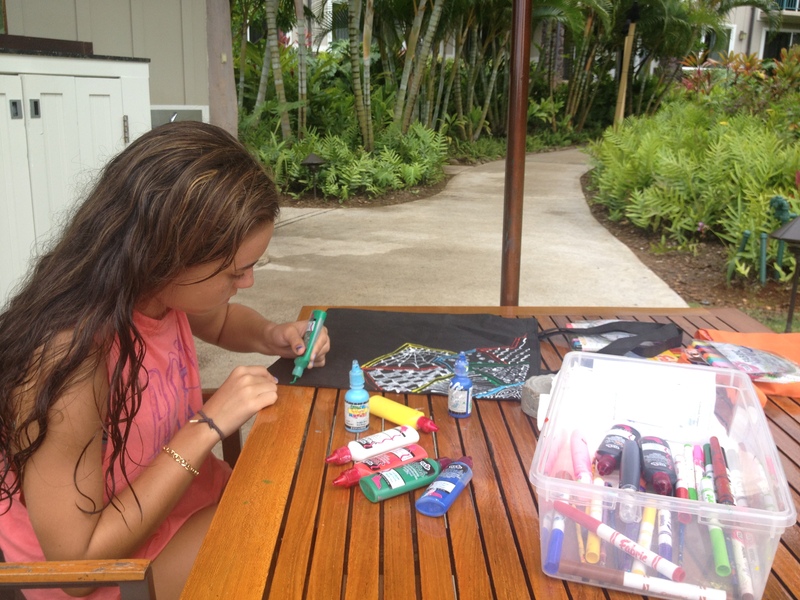 Be creative, make something different and fun since it is vacation! Go for shish kabob, marinated vegetables or lobster. Adults can enjoy long dinners with conversation while the kids splash away in the pool. 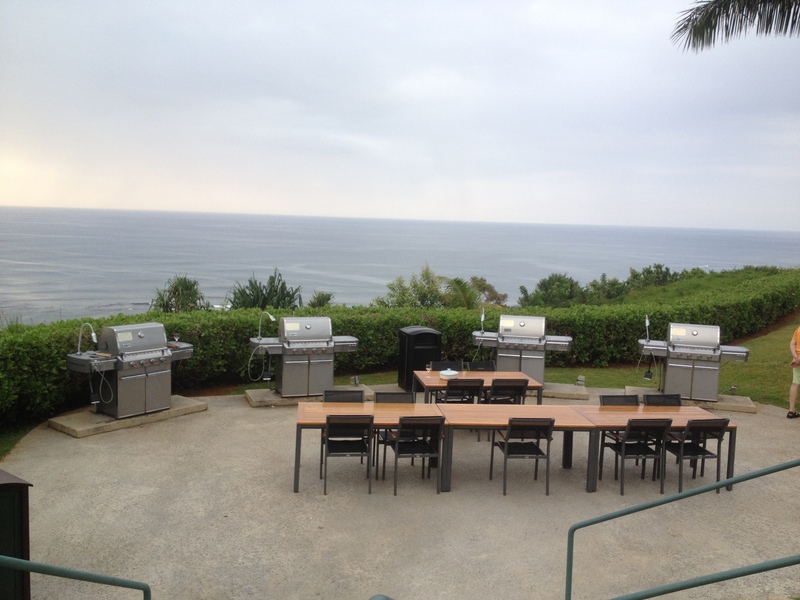 BBQ’s are located throughout the property. Availability of tables was never an issue. One evening we shared a large table with another family on vacation. The property is very family friendly and has a lively atmosphere with music playing in the evenings. There are studio, 1 bedroom and 2 bedroom units available, decorated in Hawaiian furnishings. The studio does not have a dining room or a dining room table. It is perfect for two people but very cramped for 4. The 1 bedroom villa is perfect for 4 people, as the couch makes into a bed. The 1 bedroom comes with a full kitchen, with the exception of an oven. There is a convection microwave which makes most things. We were able to make pizza one day. The 1 bedroom includes a spacious lanai (balcony) which is accessible from the living and bedroom. 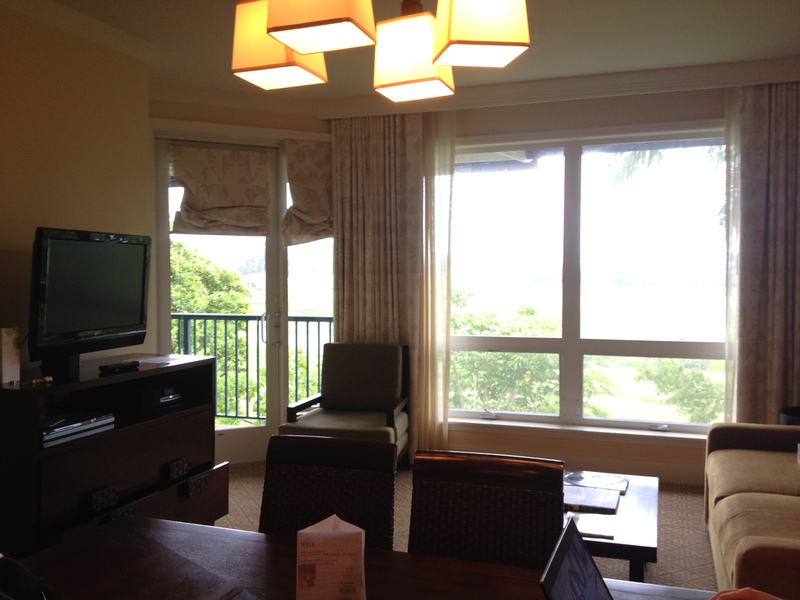 Our unit was up high with fantastic views of the golf course, trees and ocean. 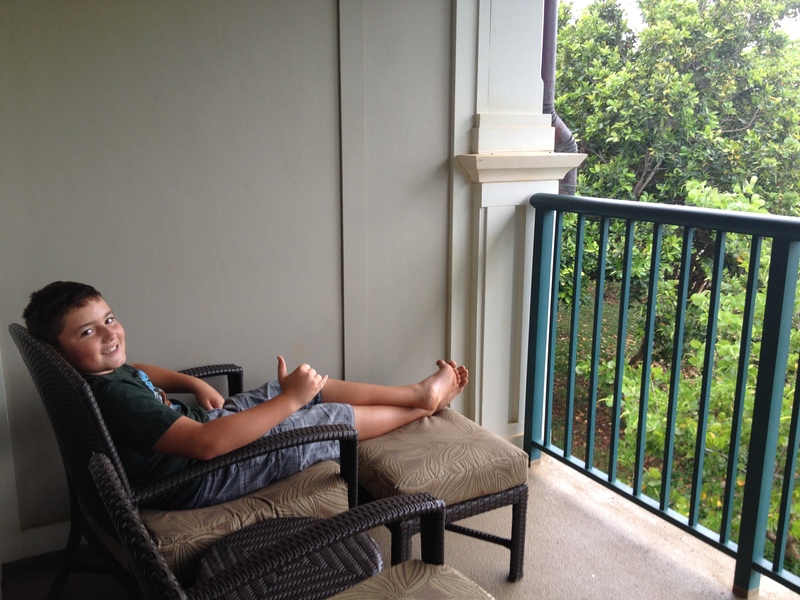 The lanai was a favorite spot in the evenings when the ocean breezes kicked up. For those of you who are not familiar with Westin brand, you are missing out on the Heavenly Bed!!!! In fact, you can order a Heavenly bed and have it delivered to your house. People were so in love with the Westin beds, that they finally became available for purchase. The best way to describe the experience of a Heavenly bed, is sinking into clouds. 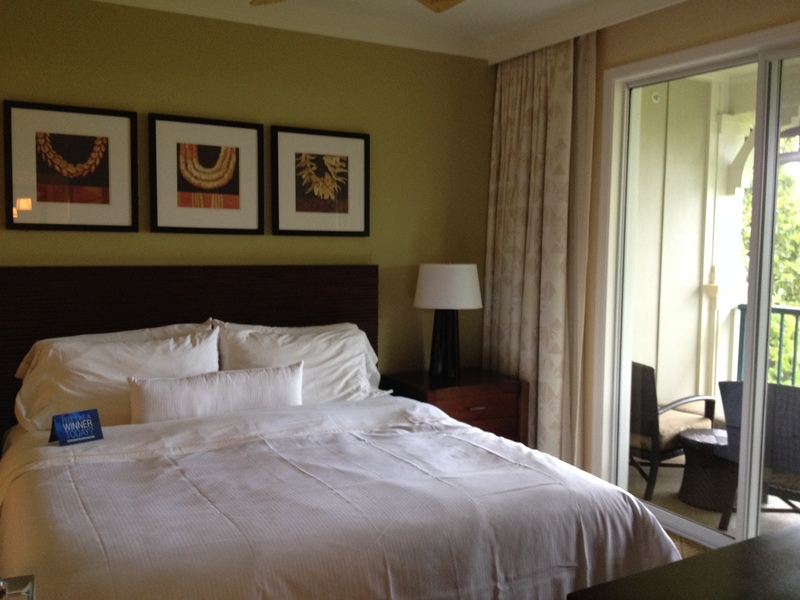 So if you want to sink into a cloud of relaxation, I suggest booking a room at Westin to try it out for yourself. Our second favorite thing about timeshare- the daily calendar of events! There is something going on daily. 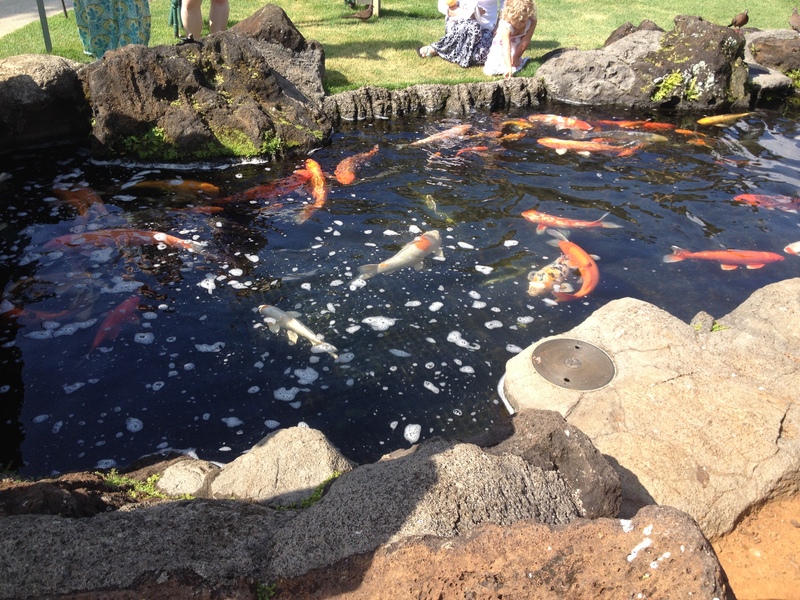 The day started out with a Fish Feeding Frenzy at the Koi pond. The kids were given fish food to throw into the pond while they were educated about the Koi fish. Next we were off to arts and crafts where the kids designed a tote bag. Get the puffy paints out, choose a tote and start designing. The best part is, everything takes place outside near the pool. Kids will love the henna tattoos, tissue paper flowers, and coconut postcards. Money Savings Tips~ Compare room prices by searching all hotel search engines such as hotels.com, expedia.com, priceline.com and orbiz.com. You don’t have to be a timeshare owner to enjoy the benefits of a timeshare property. Many owners give their weeks up for points or trade out for other properties and then the property sells the units fpr a nightly rate. Stop off at Costco (near the airport) prior to heading up north to the Westin. Grab enough groceries for your stay and keep bbq’n in mind. Costco is a one hour drive each way from the property, so it’s best to only go there once during your stay. 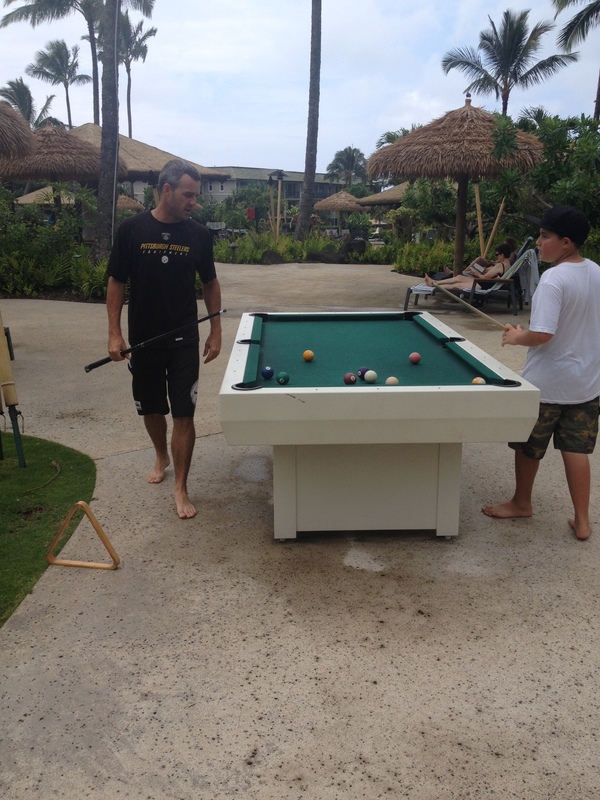 The Westin is a great place to enjoy grilling poolside while the kids play. serve burgers. Duane’s Ono Char is a shack, literally. Plan on eating outside among chickens roaming about, IF you can find a seat. Pick up your food in a red, plastic basket at the window. It’s a burger joint, so don’t expect more than that. 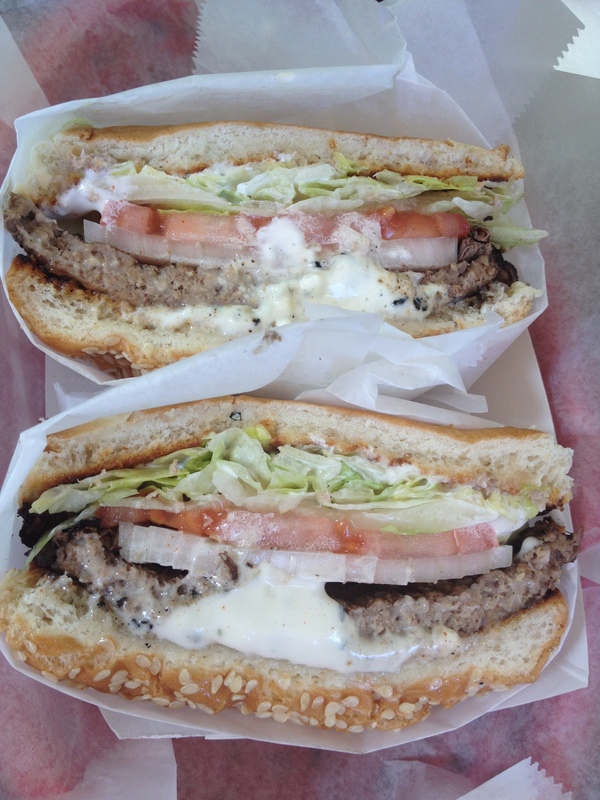 At Duane’s you can order a burger almost any way. Choose from teriyaki sauce, mushrooms, cheddar cheese, blue cheese, swiss cheese, avocado, pineapple, barbecue sauce, grilled onions, sprouts, or bacon. Local favorites include the broiled fish sandwich and the marionberry ice-cream shake. Boca Burger is a veggie burger made of soy protein and wheat gluten. Soy-based meat alternatives are becoming more and more common at hamburger joints. Originating from Boca Raton, Florida, in 1979, Boca Burgers were known as the “Sun Burger”. The organic Boca Burger was created in 2001. They are available in grocery stores, club stores, natural foods stores and at restaurants nationally. Give me Caviar Kaspia and give me a hamburger. I love the two extremes. 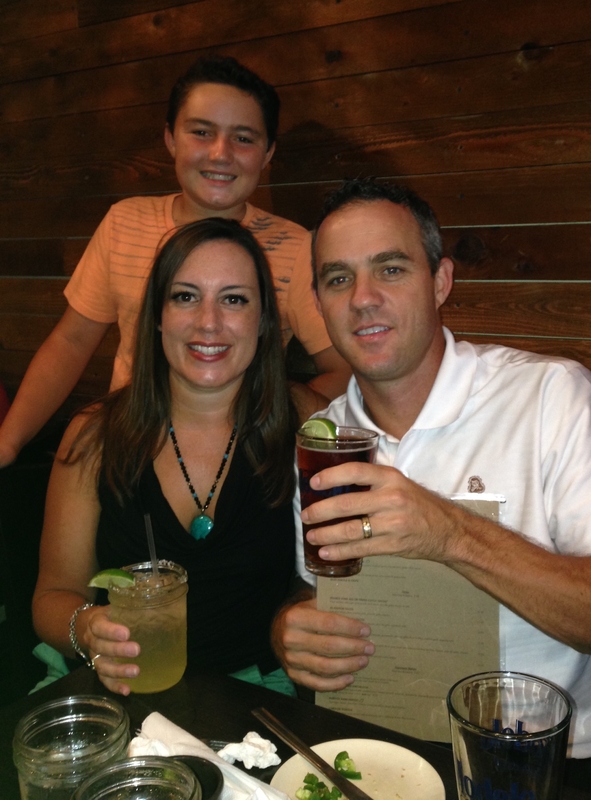 Duane’s Ono Char Burger is a family friendly burger shack complete with a kids menu! 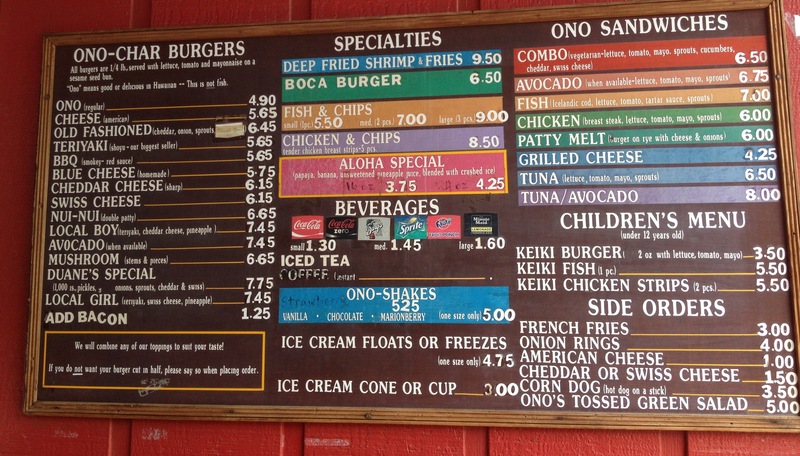 Kids will be happy to have their own options which include: Keiki (kids) Burger, Keiki Fish or 2 piece Chicken Strips. The french fries and onion rings are a must! Try shaking some Kauai sea salt on top of the french fries. Yummy!!!! The shaker is located on the counter where you pick up the food.